I recently purchased a LG TV capable of 3D display. 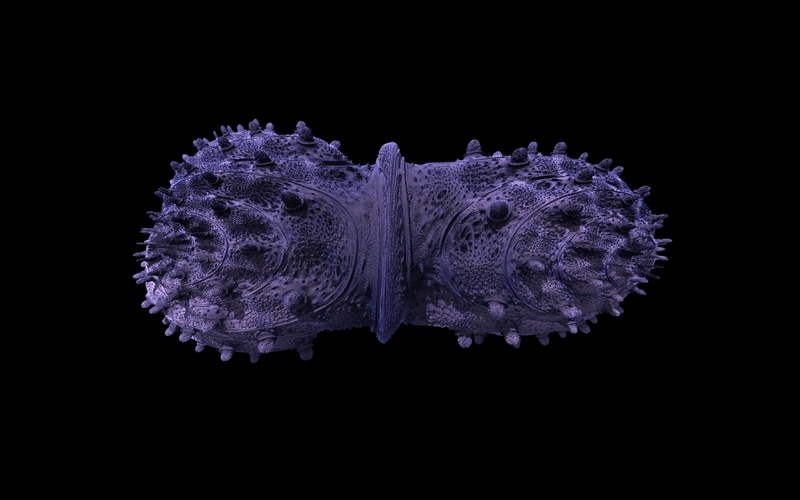 It comes with passive 3D glasses (ie no shutters with polarised lenses – similar to the ones you wear in the cinema when watching a 3D movie). The first thing that came to mind was how do I get Visions Of Chaos to output images that the TV will show in “real” 3D when wearing the glasses. 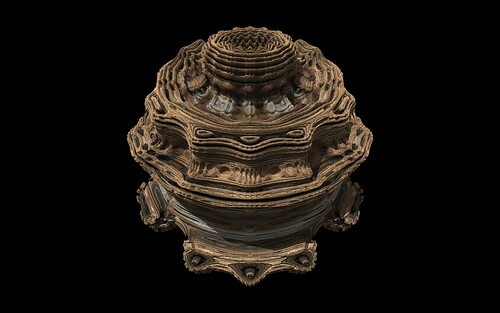 Firstly I discovered the MPO format. 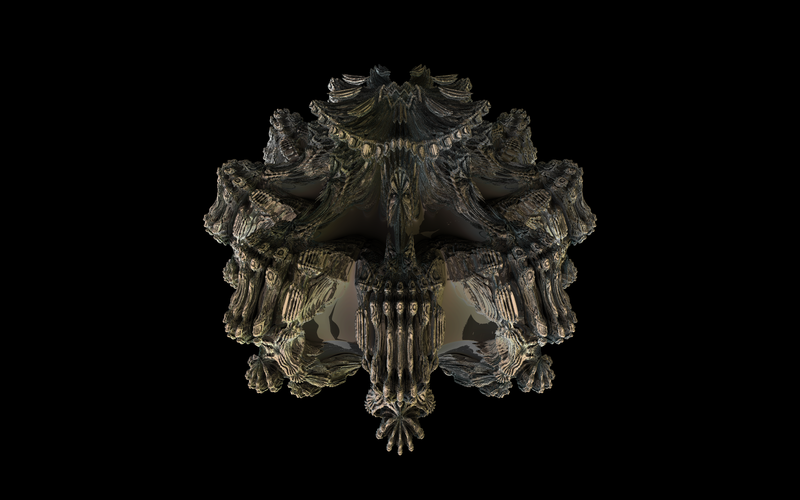 The official MPO spec is too complicated for me to implement and doing a quick web search for source code shows nobody else has worked it out who is willing to share a snippet. 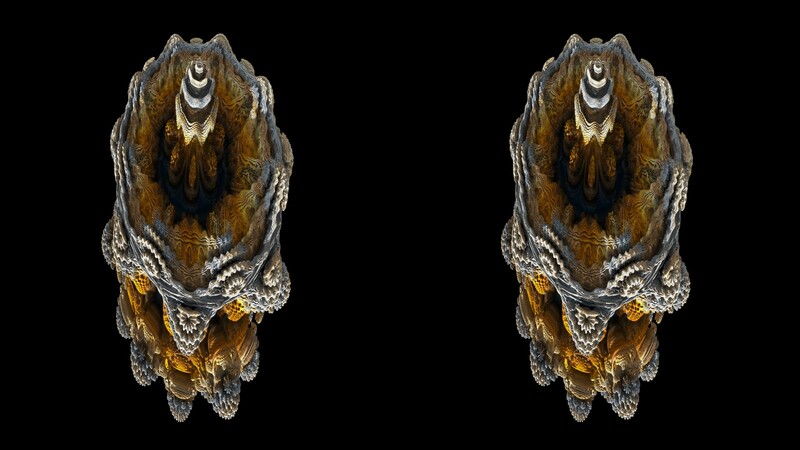 Note: if you have a left and right eye image file and need to combine them into MPO format you can use Stereo Photo Maker. Then I found the JPS format which is a much simpler 3D image format to support. 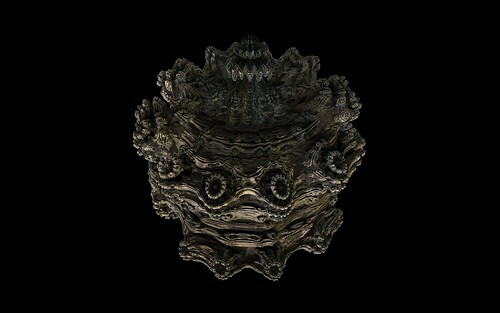 JPS is simply a JPEG image file with the two eye images side by side. 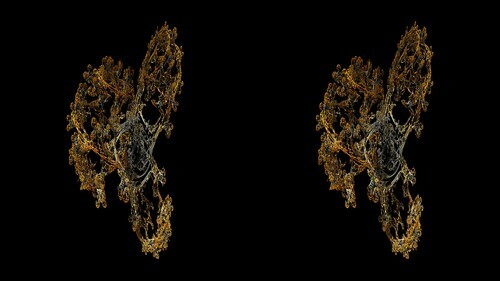 The right eye image on the right and the left eye image on the left. 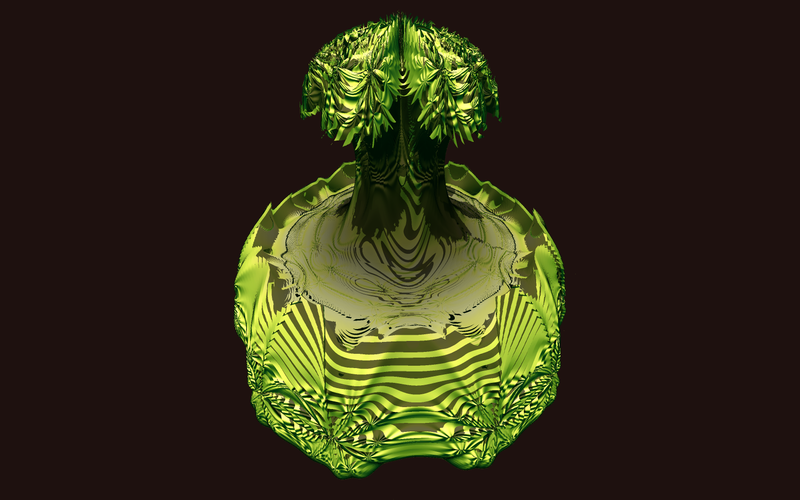 Getting Visions Of Chaos to stitch the left and right images together into a JPS was simple, so now anyone with a JPS capable device will be able to see fractals (and any 3D output) from Visions Of Chaos in real pop out of the screen 3D. 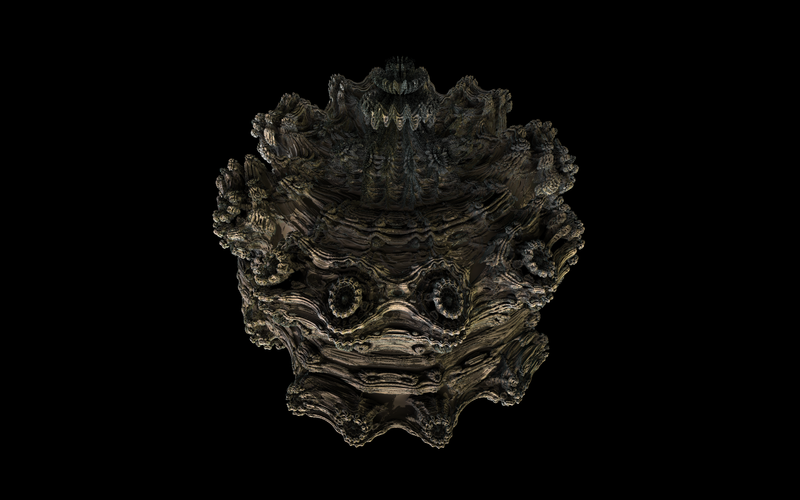 Each JPS image should be HDV 1080p resolution (1920×1080 pixels), and each of the “eye” images needs to be resized/squashed to half width. 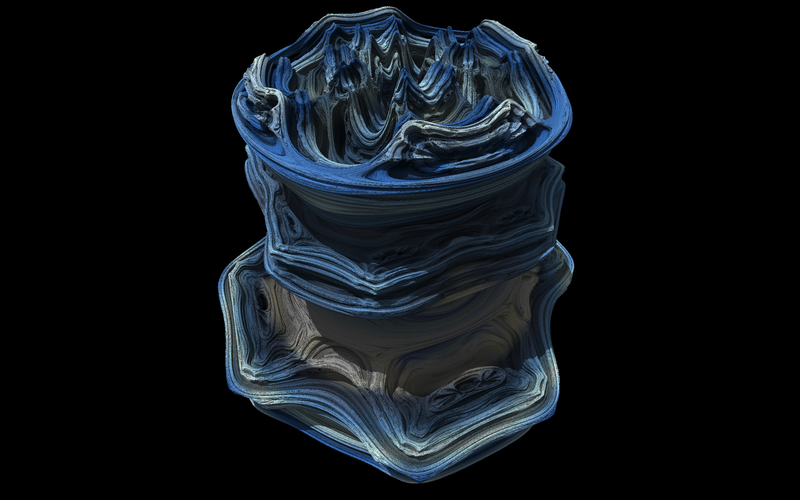 If you have a device capable of displaying JPS images, download the above image, rename the extension to JPS and view it to see in real 3D. 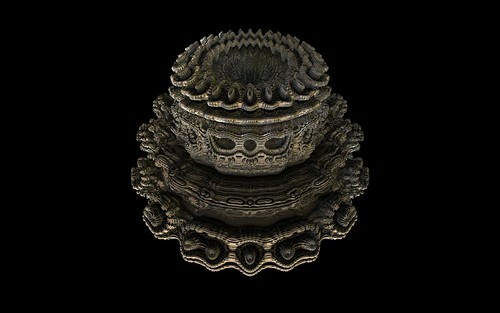 Here are a few other sample images. Again they need to be renamed to JPS before viewing on a device that supports the JPS format. See more in my flickr gallery. 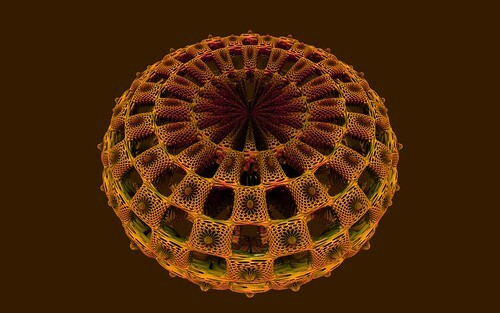 All of these images really “pop” on my TV and have impressed even non-fractal friends who have seen them. 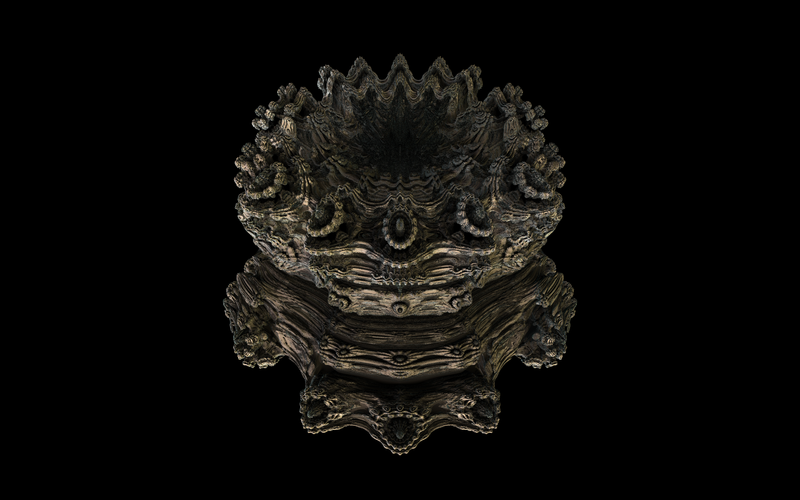 Visions Of Chaos now supports JPS stereoscopic images along with the usual anaglyph formats (red/blue, red/cyan, wiggle gif, etc). 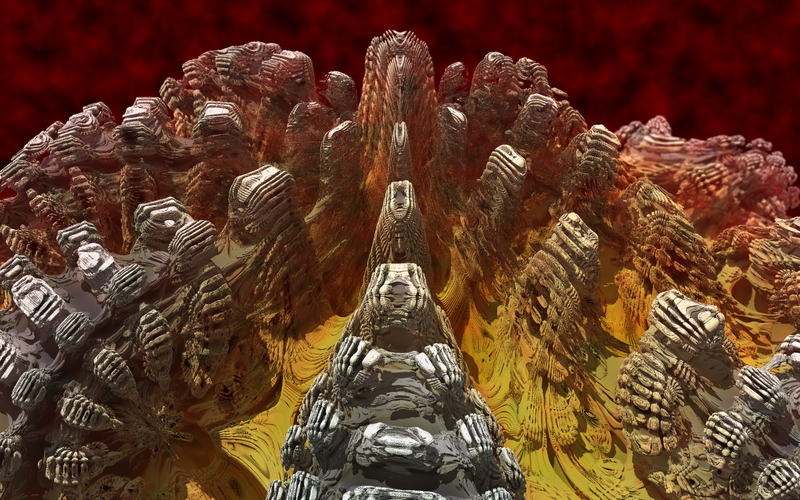 The next step was to support 3D movies. 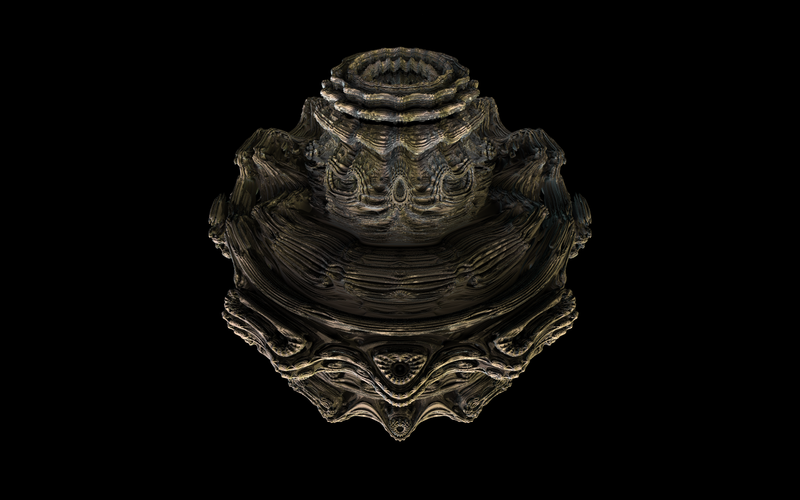 All the 3D outputs in Visions Of Chaos now support side by side real stereoscopic 3D output. Here is a quick sample. 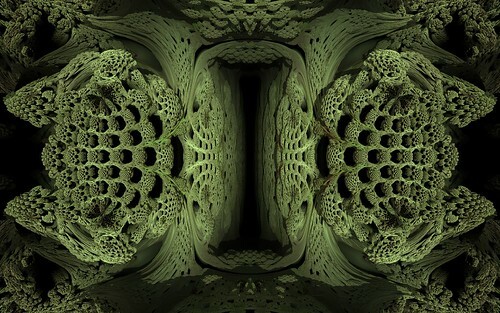 On a 3D device you can look deep into the fractal structure. 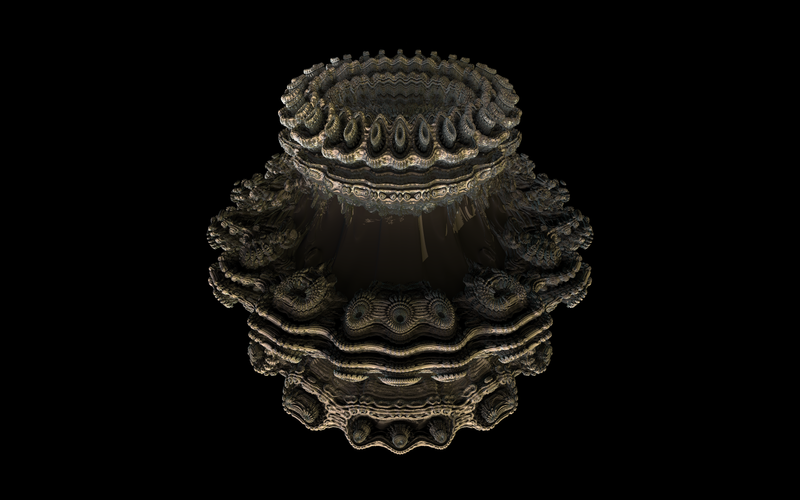 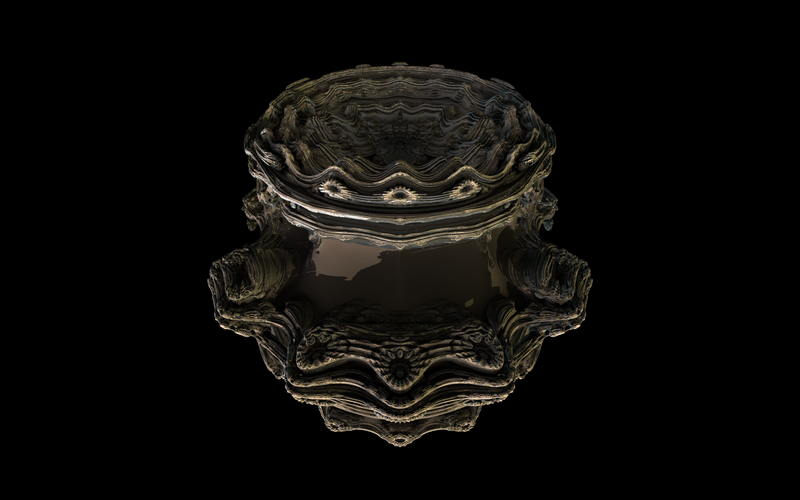 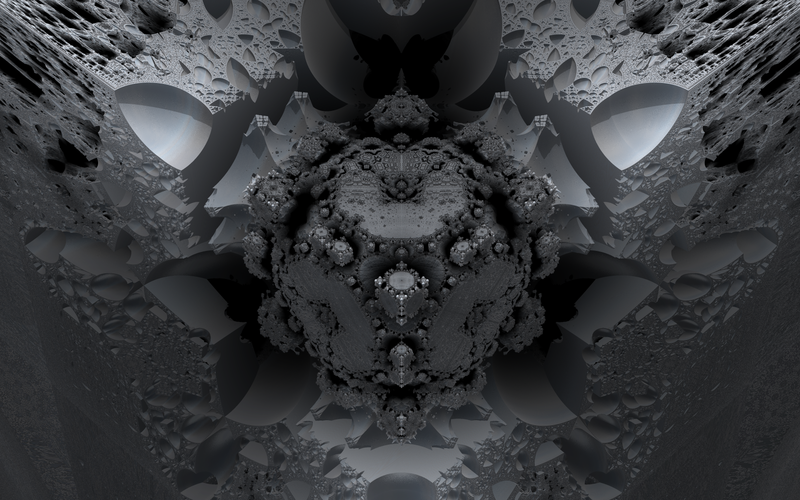 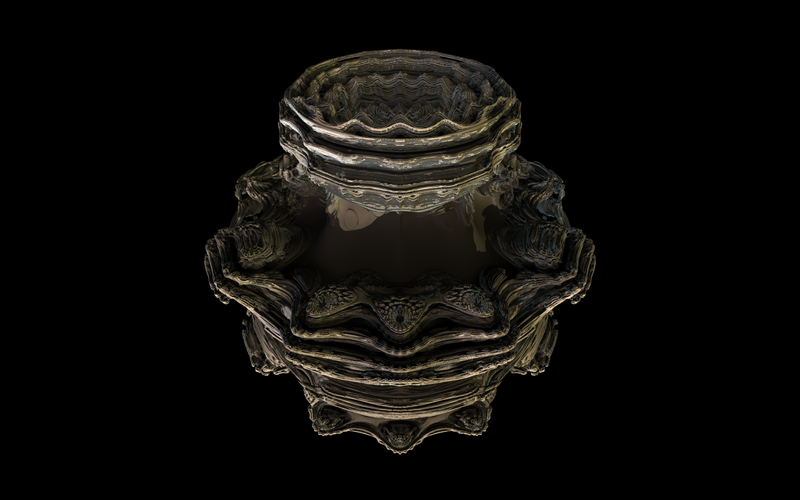 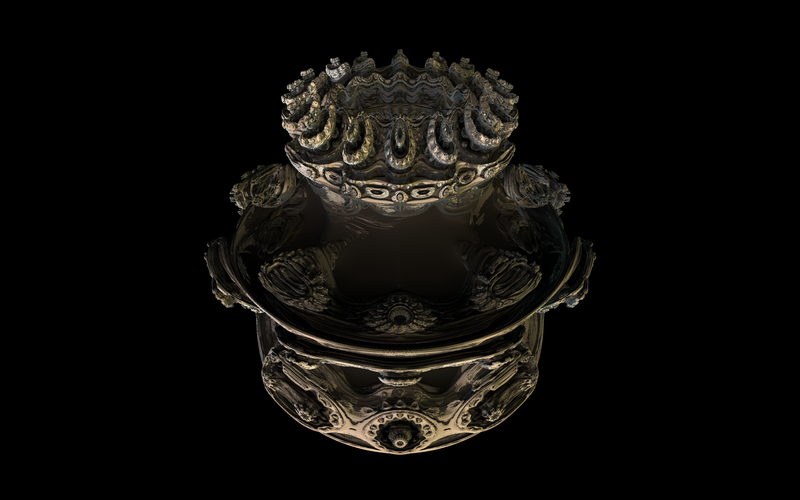 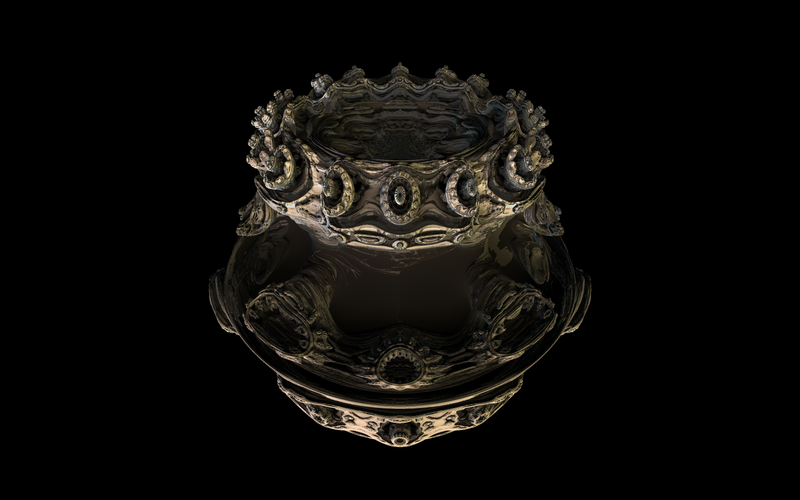 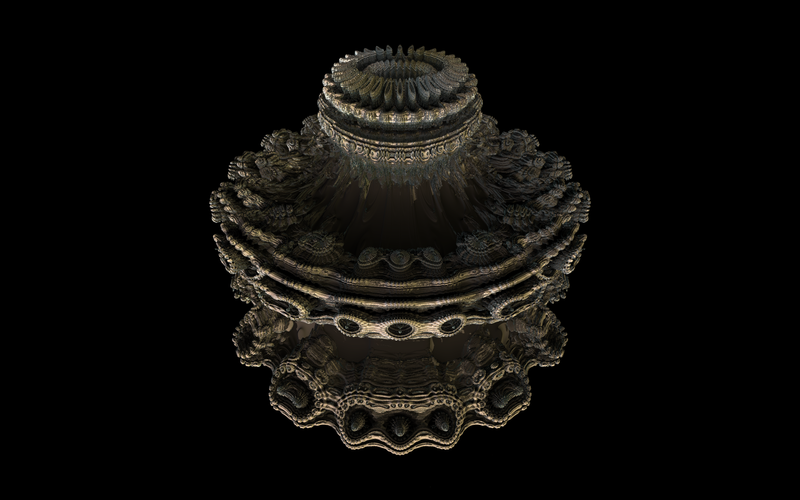 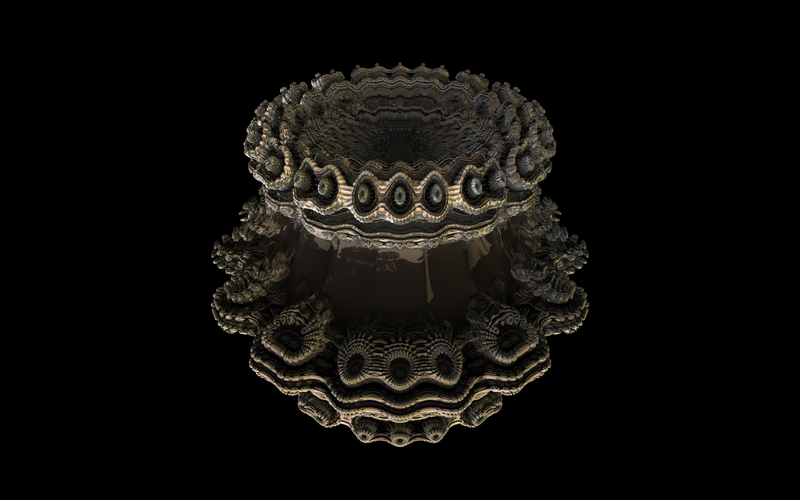 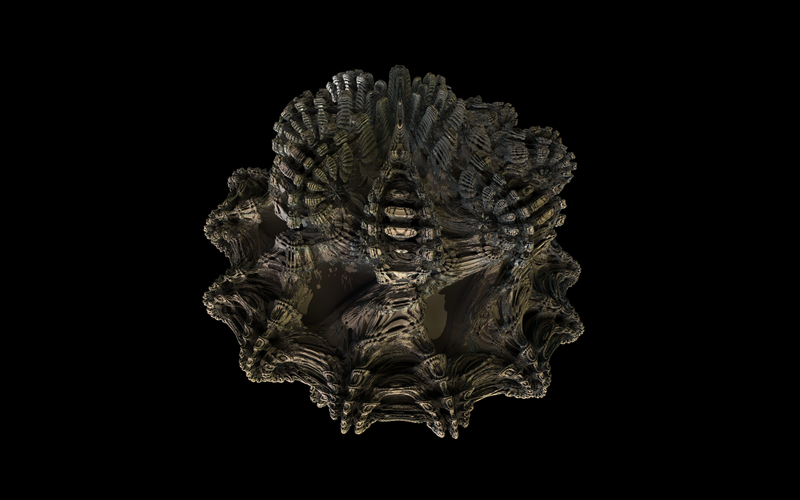 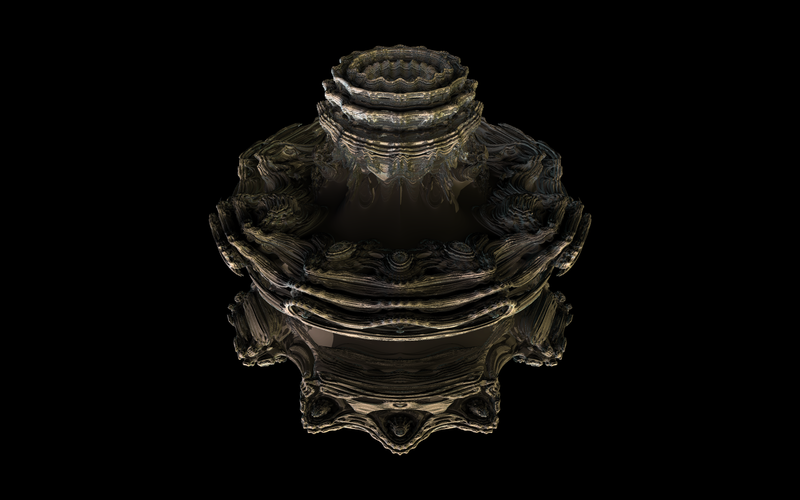 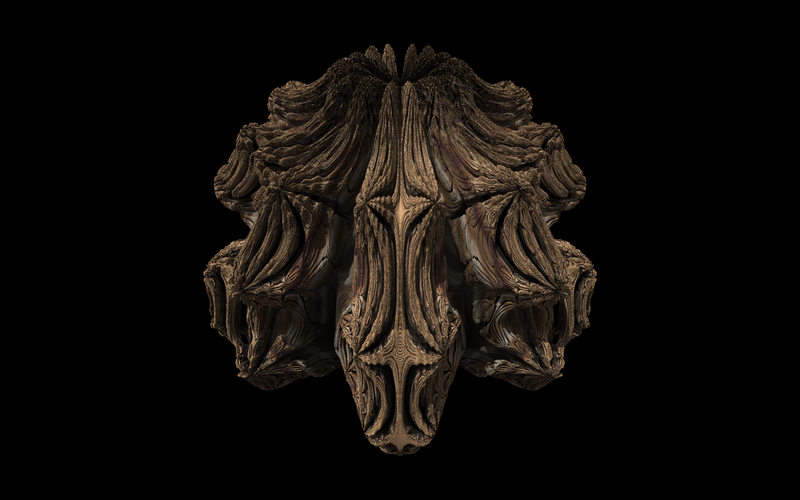 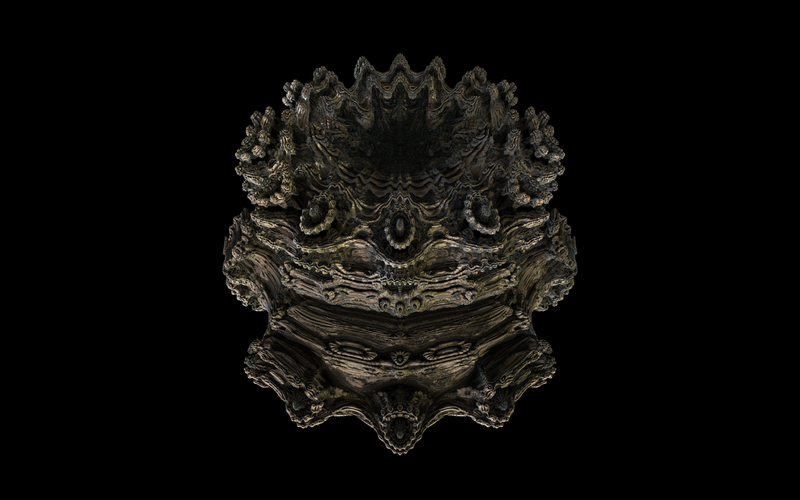 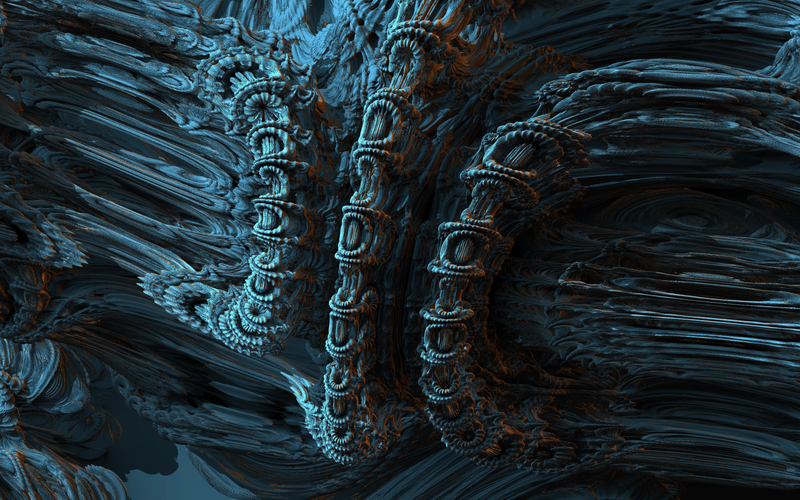 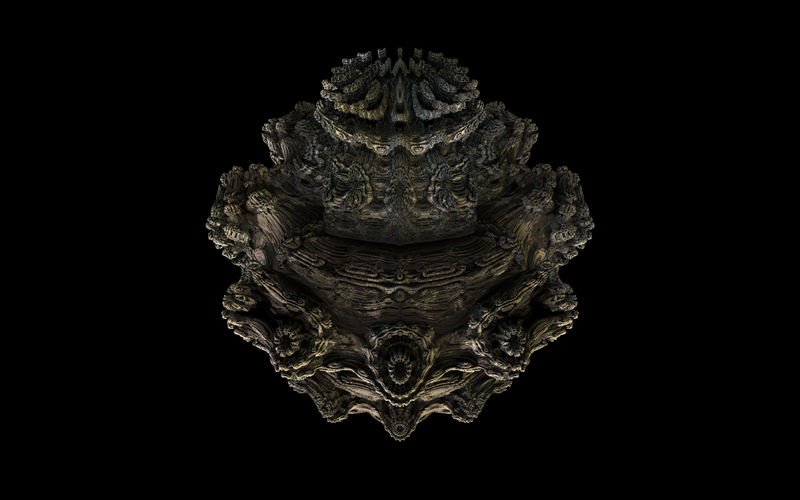 After the last success with new Mandelbulb variations I extended the possible search space. These variations are also created from formulas from Tad Boniecki. 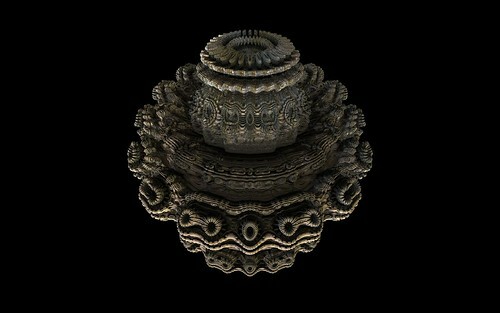 Three of his variations followed these same basic forms. 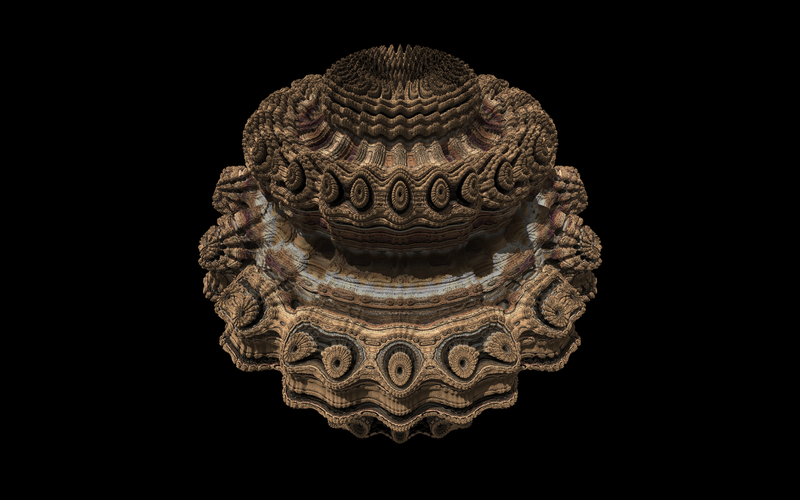 This bumps the total possible variations up to 4096. After letting the PC churn away for a few hours I had all possible variations with thumbnails (I have avoided posting all 4096 images to flickr this time). 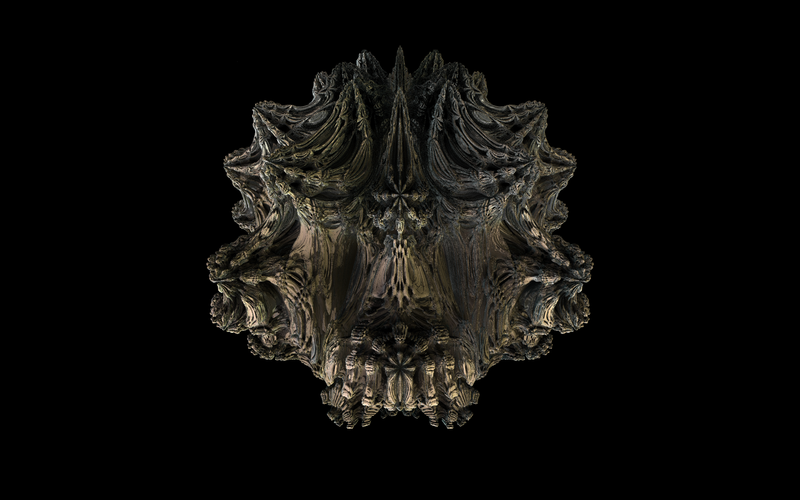 After deleting the spikey and lathed results this got the count of possibles down to 1288. Deleting all the assymetrical results got the count down to 266 possibles. 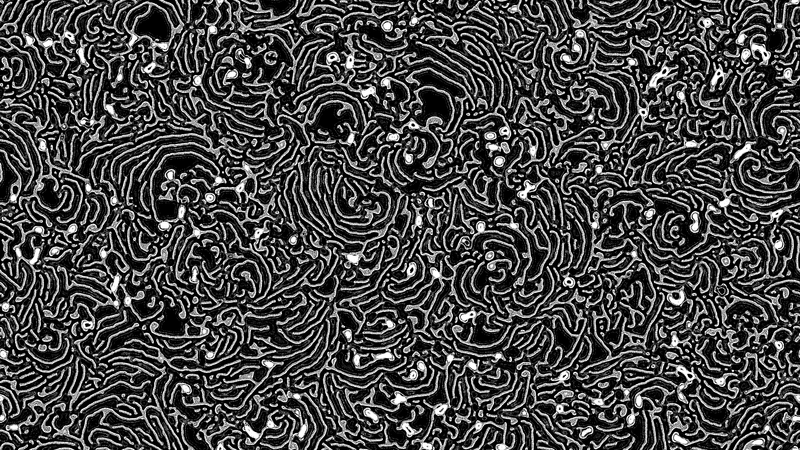 Then comes the difficult part. You get down to a bunch of symmetric bulbs that fall into catagories of similar shapes and styles. 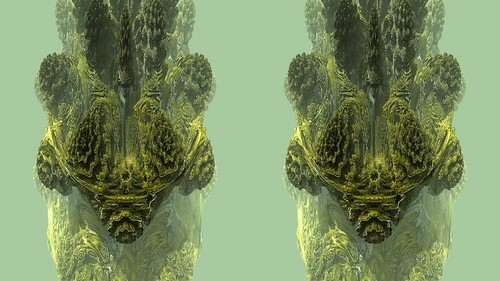 Culling down the least interesting out of a bunch of 10 or so very similar images sent me cross eyed. 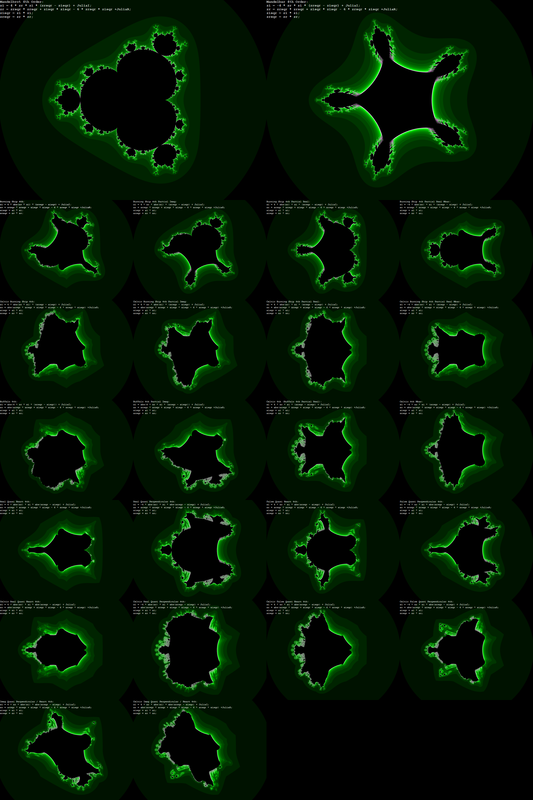 In the end I narrowed 4096 down to 27. The new methods changed the trig values for X, Y and Z. The main change here is there is only a single trig call for each XYZ component. After randomly trying different combinations for a while, I wrote a simple loop to go through all possible combinations of these type of Mandelbulb. 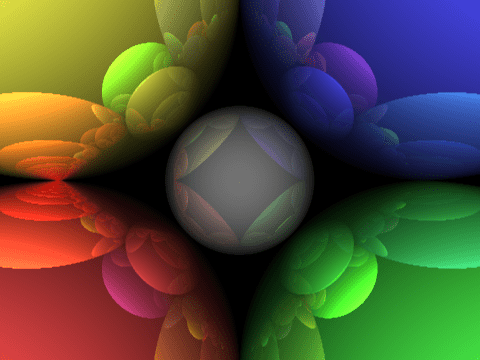 For each of the XYZ components they can be in the form +/- sin/cos(phi/theta). 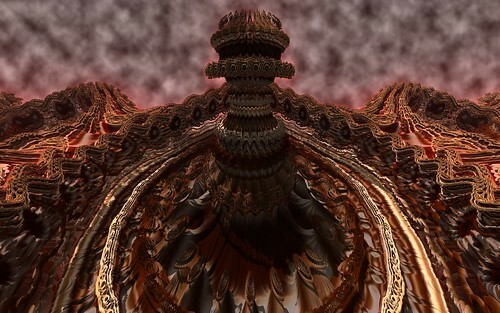 eg -cos(phi) or sin(theta) etc. 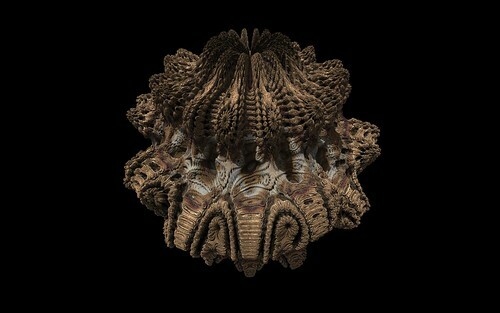 This gives a total of 512 possible combinations. 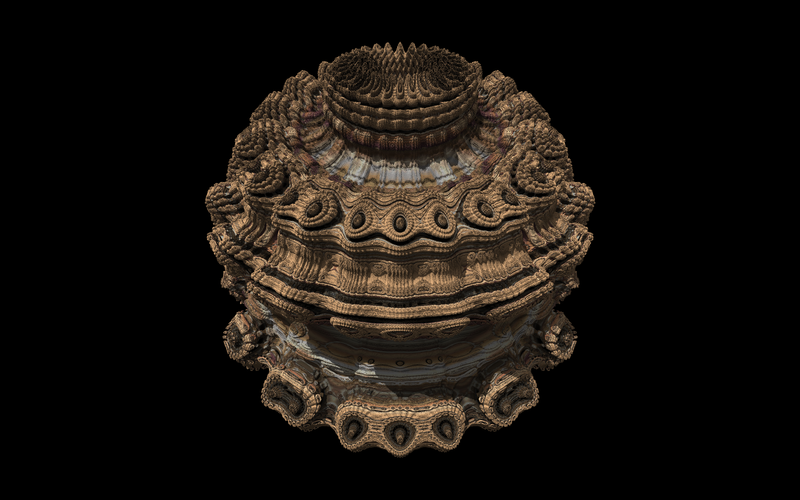 You can see all 512 variations (all power 8 Mandelbulbs) here. 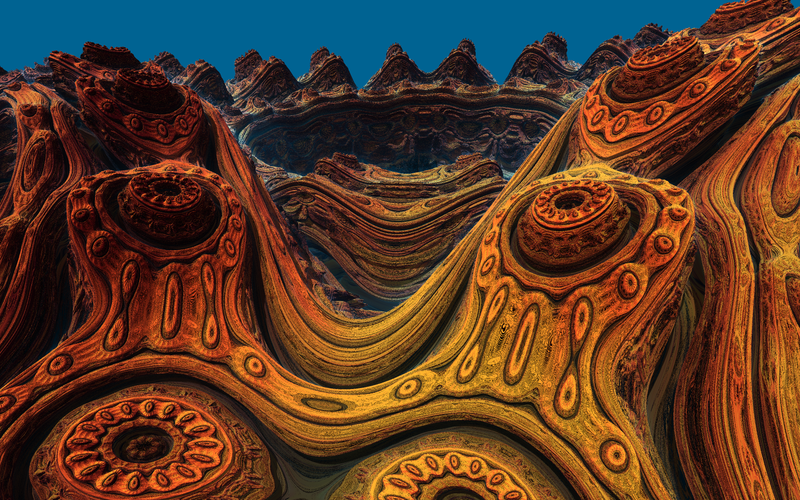 Each of the image names show the rule number and corresponding trig calls. 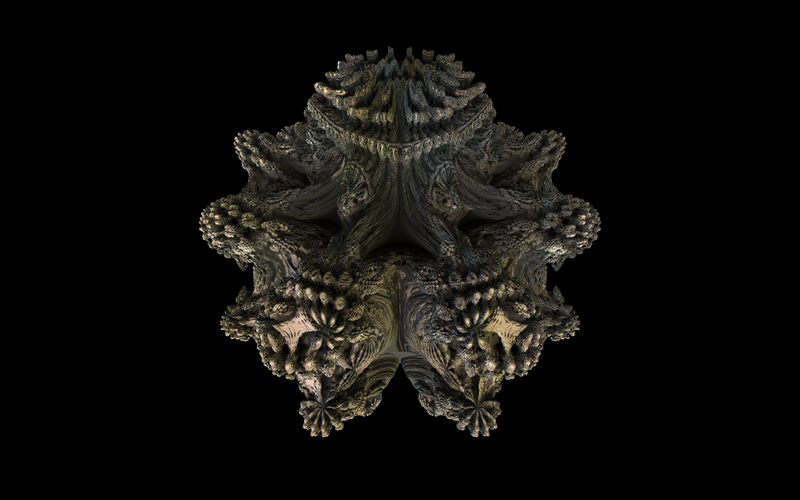 From the 512 possible results, I ignored most of them (too spikey, too similar to others, too lathed, or assymetrical) and picked the 20 most interesting results. 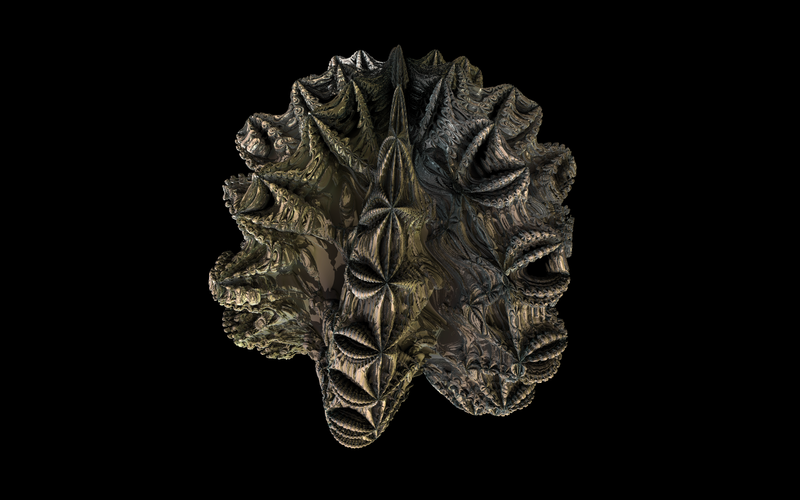 Tad also had a few other new variations with more trig calls I will experiment with and explain in a future post. 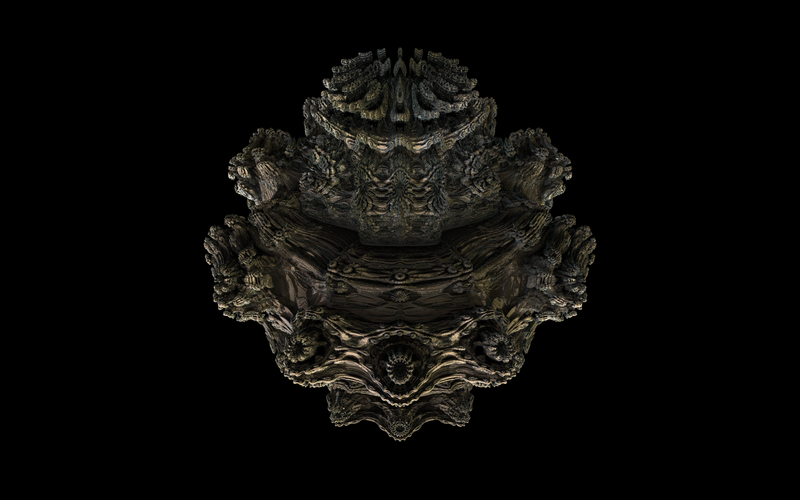 The new version of Visions Of Chaos now supports multiple lights with individual light colors and intensities. 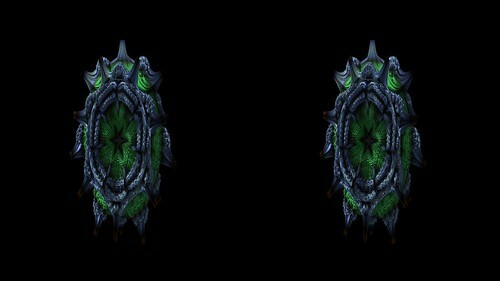 Here are a few sample images to show how multiple lights work. In these images the fractal surface is white/greyscale and the colors come only from the lights surrounding the fractal. 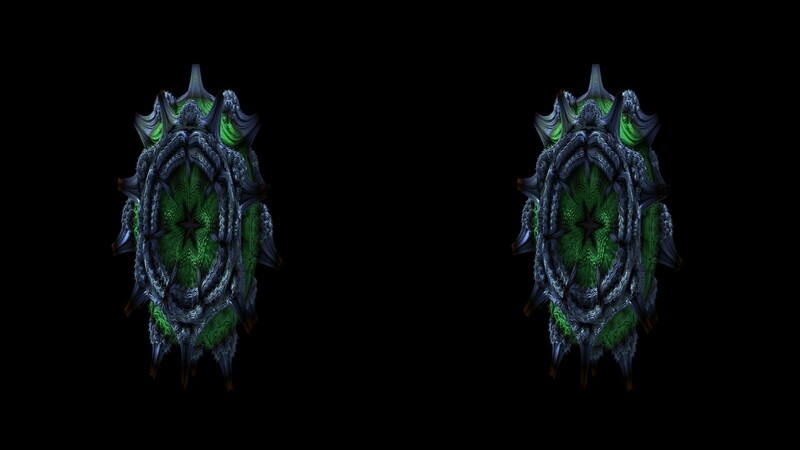 Here are two sample movies using multiple lights. 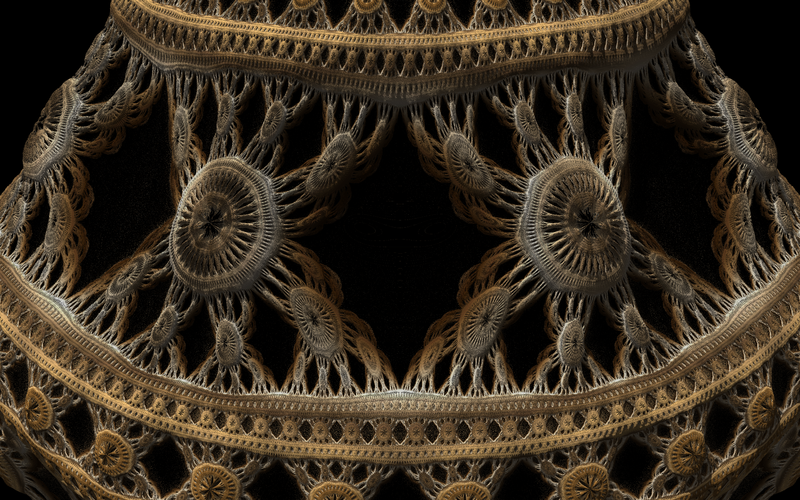 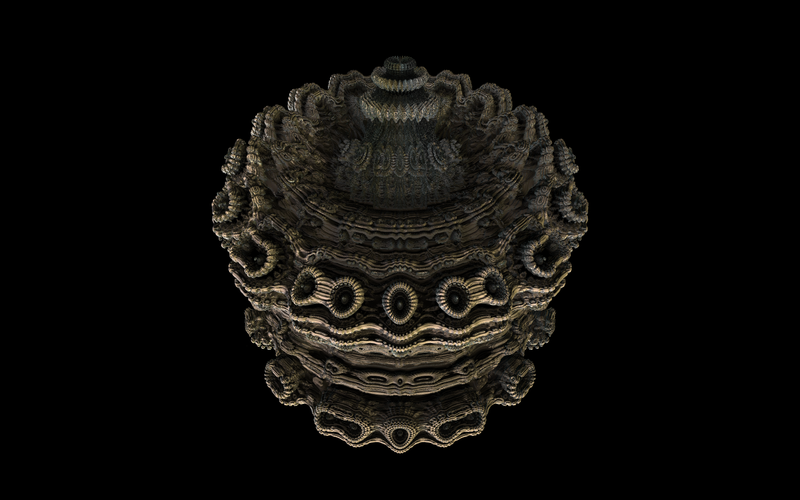 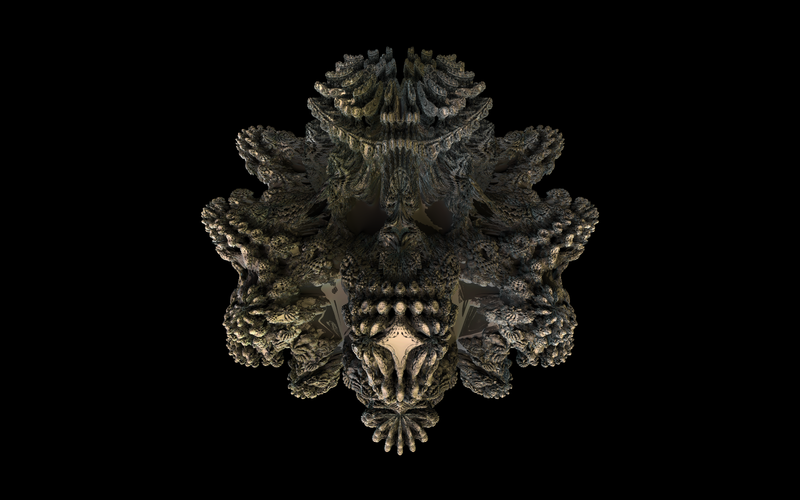 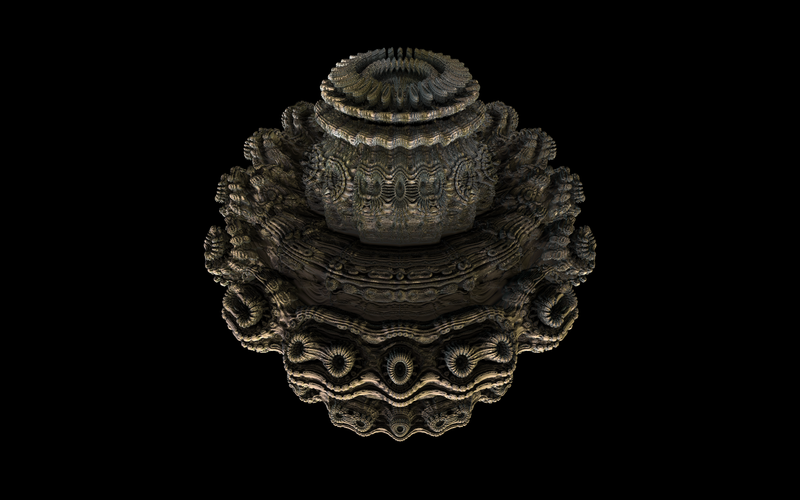 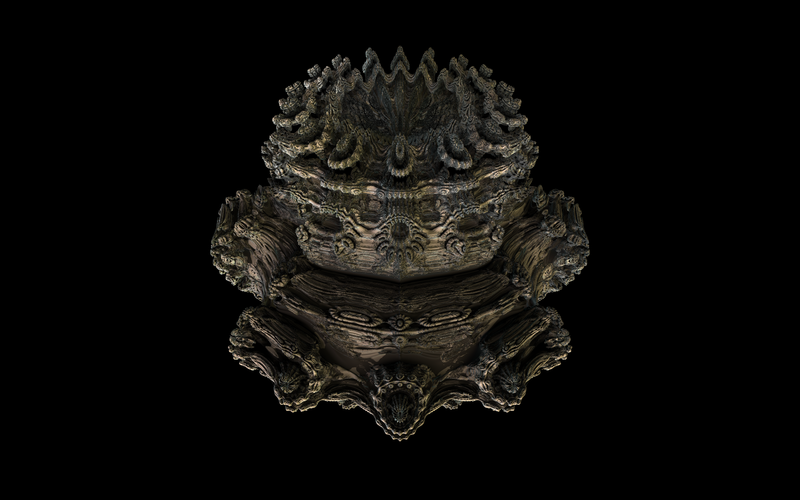 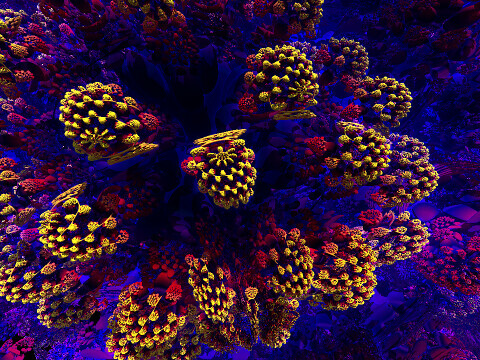 The new version of Visions Of Chaos now supports Hybrid Mandelbulbs. 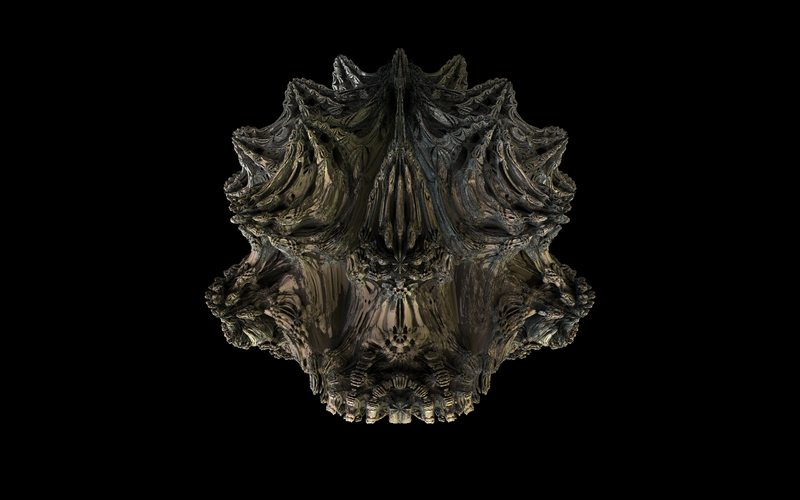 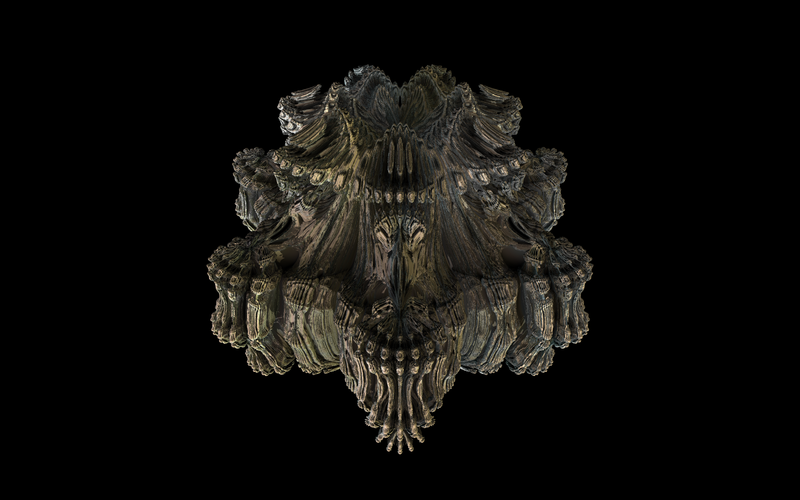 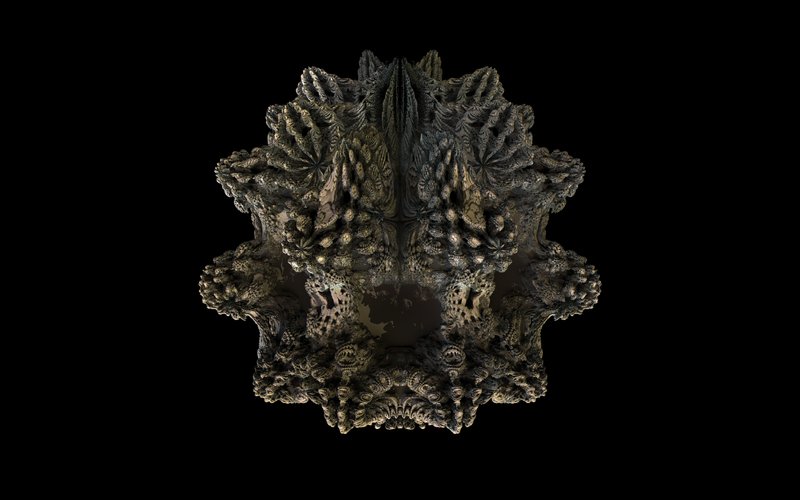 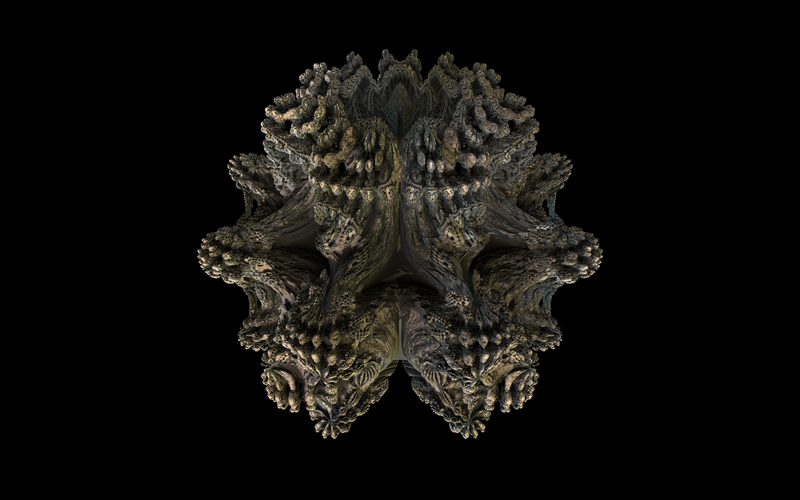 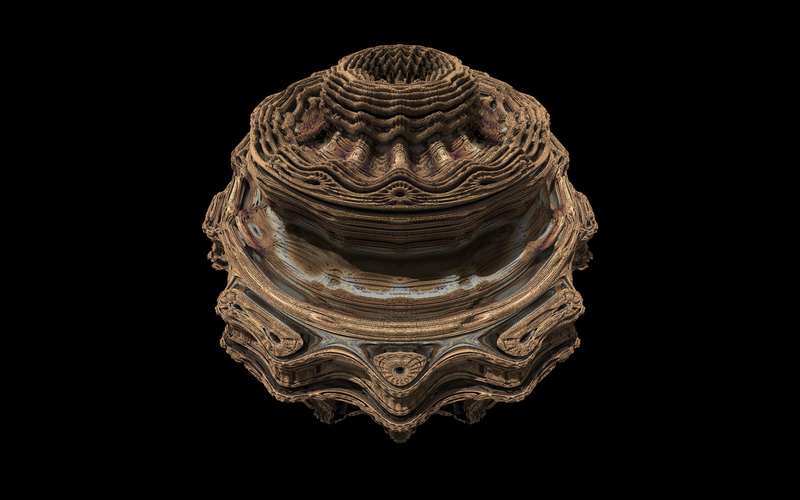 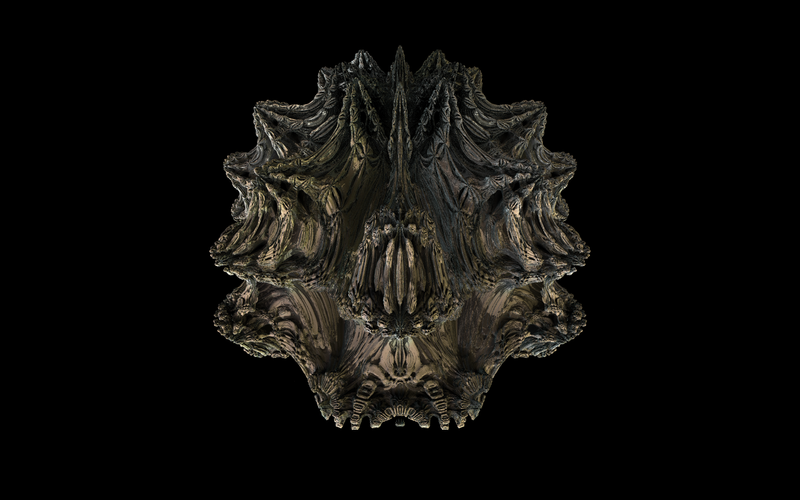 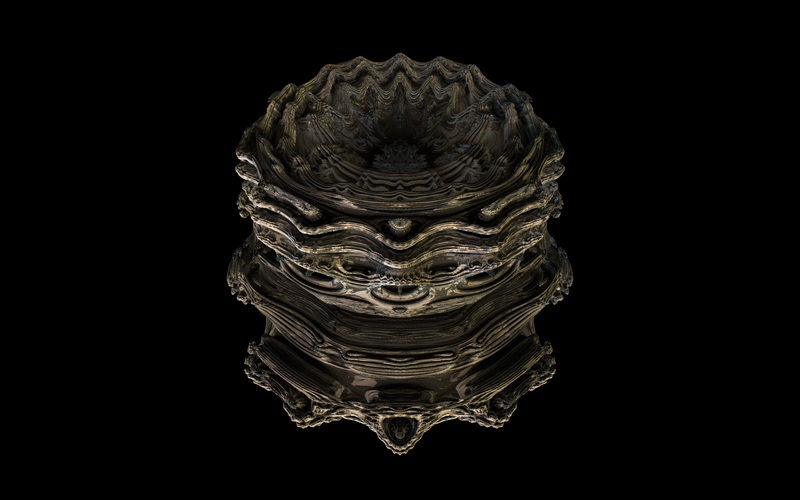 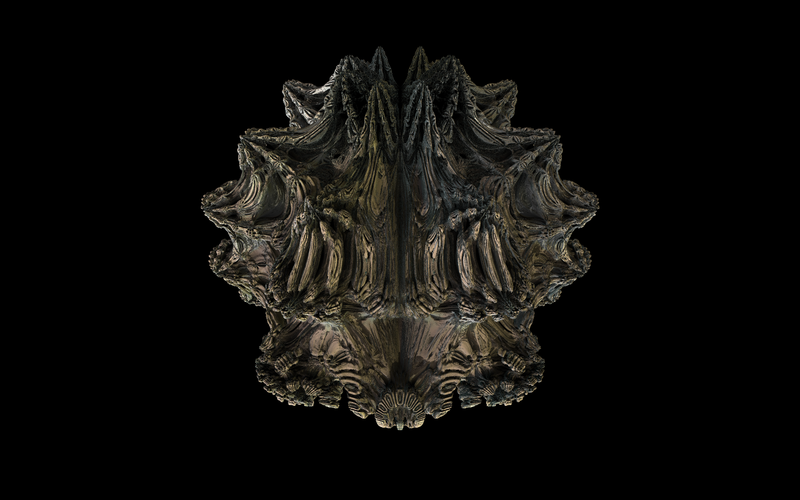 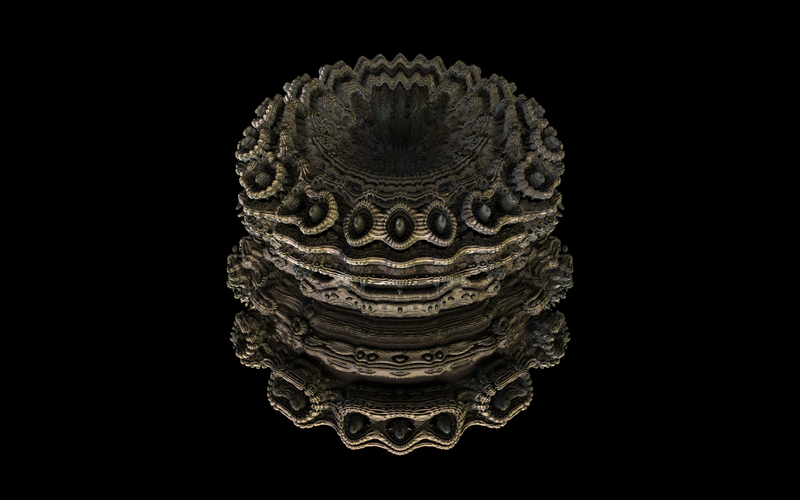 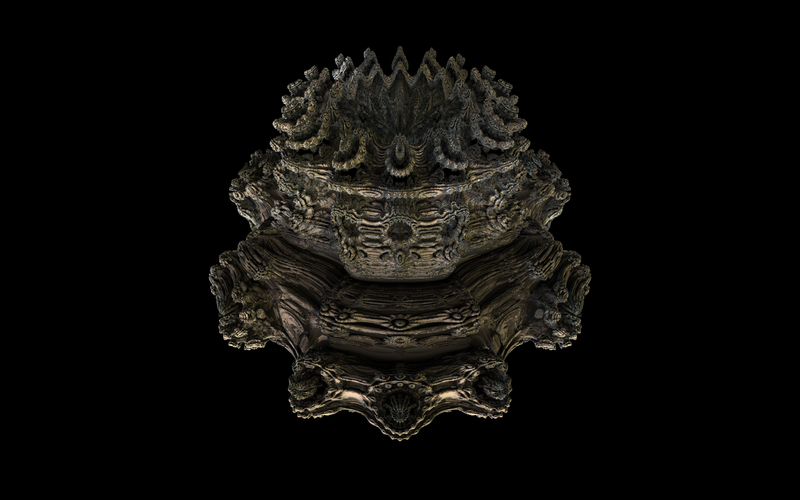 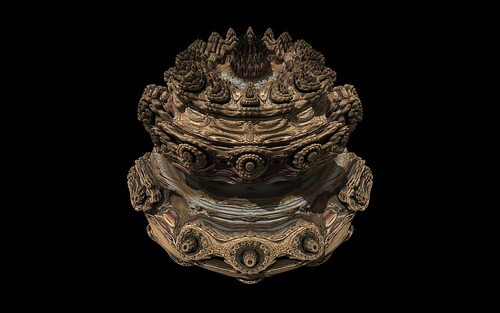 The basic idea is that you alternate the Mandelbulb formula between iterations for each pixel. So for example the 1st, 3rd, 5th, etc iterations use the regular positive SIN Mandelbulb formula and the 2nd, 4th, 6th, etc iterations use the Rucker variation. 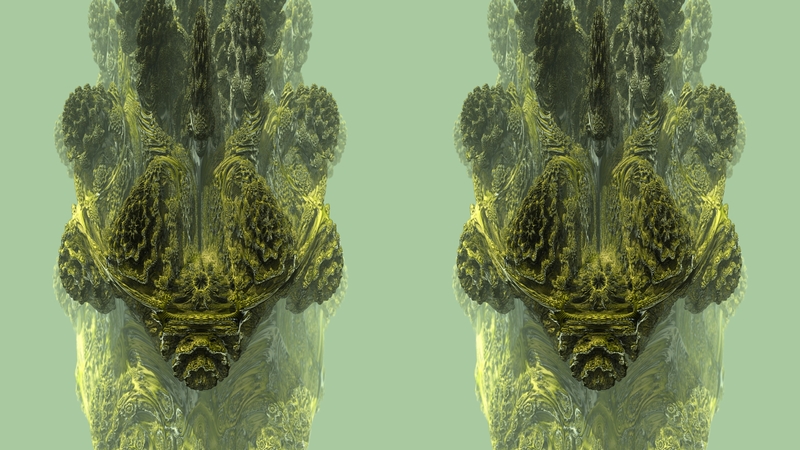 Here is a quick sample movie. 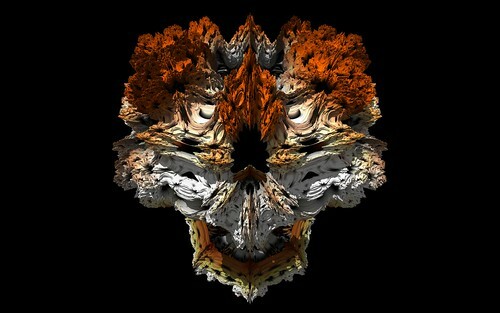 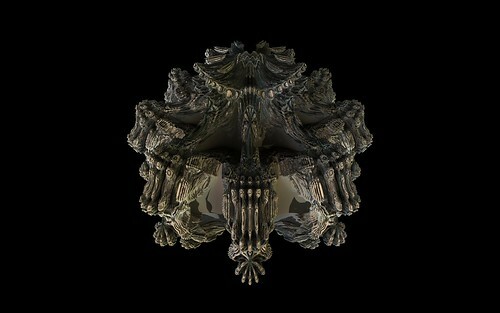 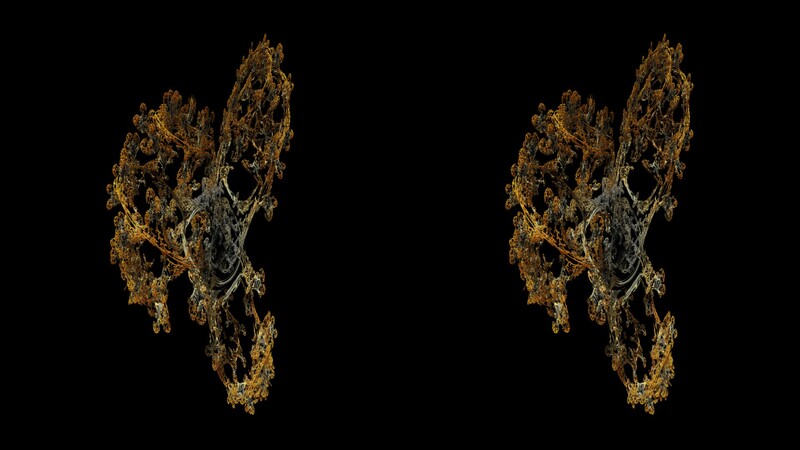 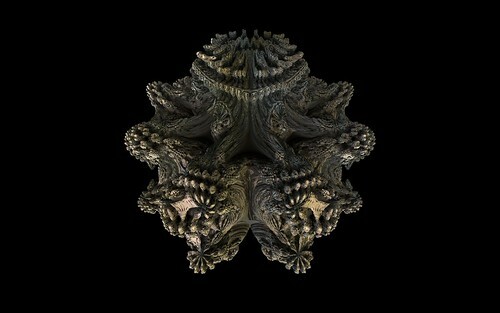 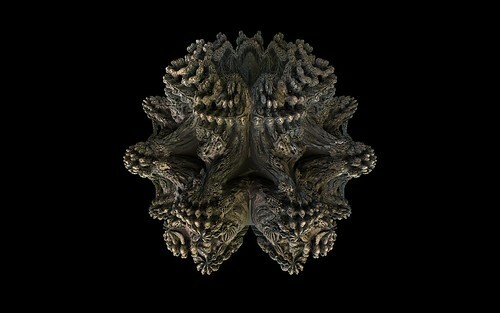 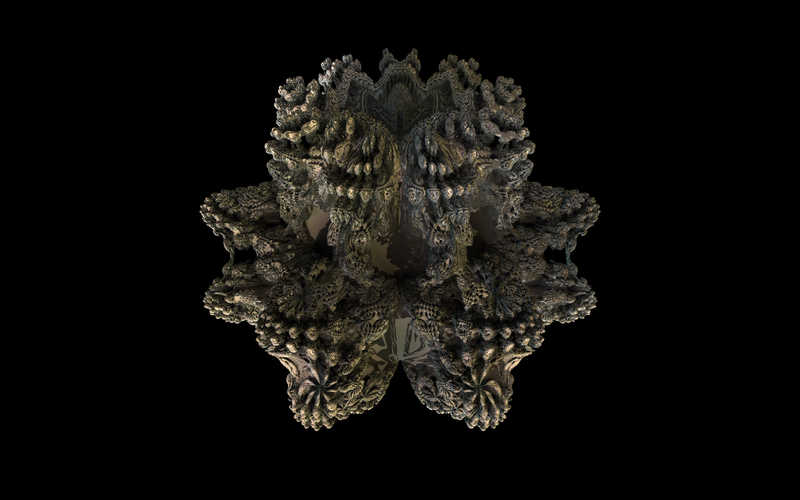 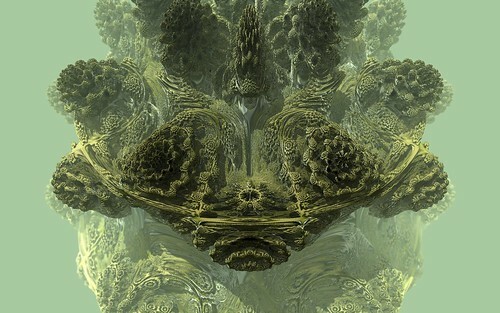 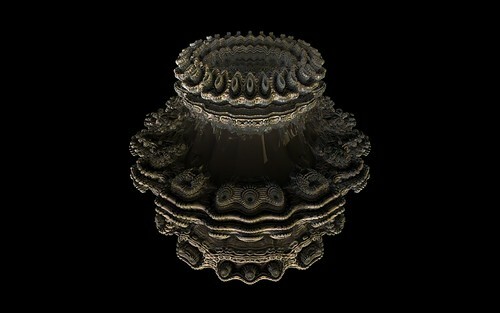 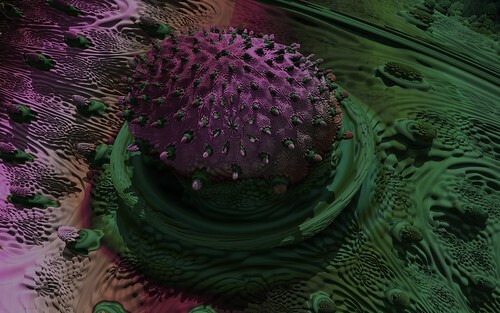 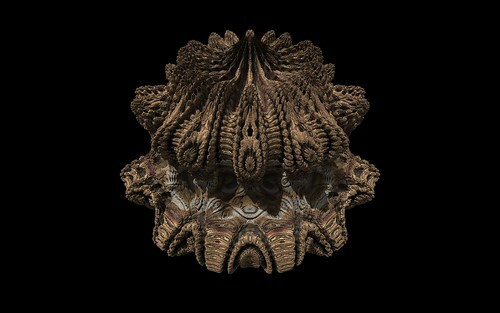 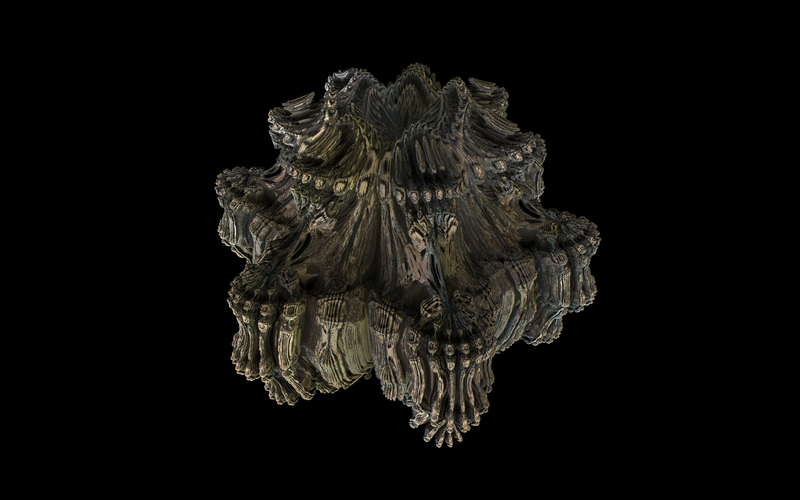 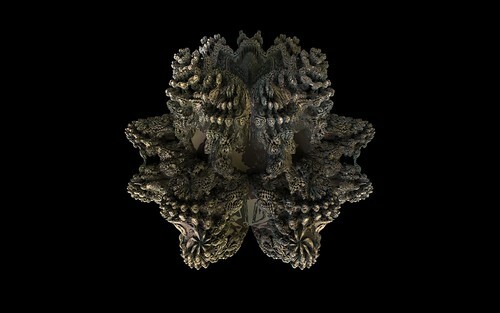 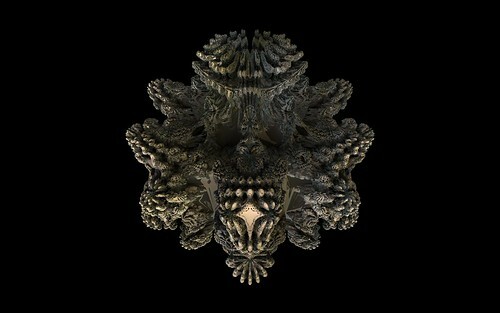 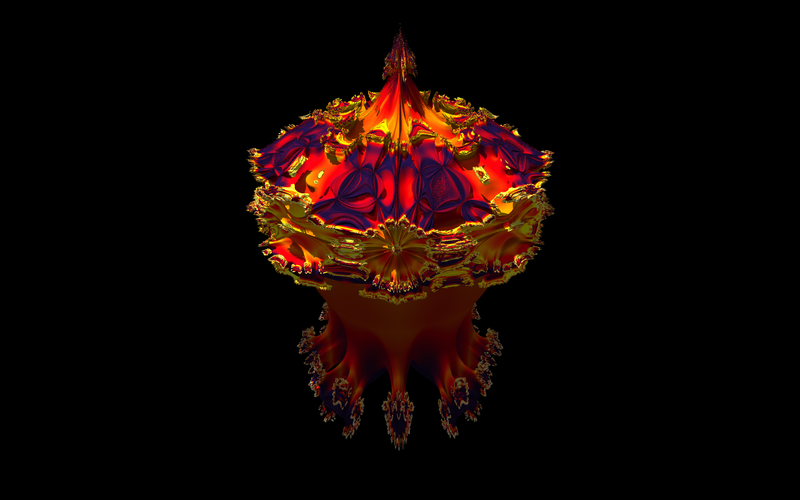 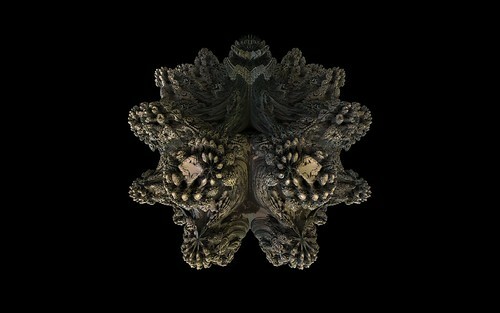 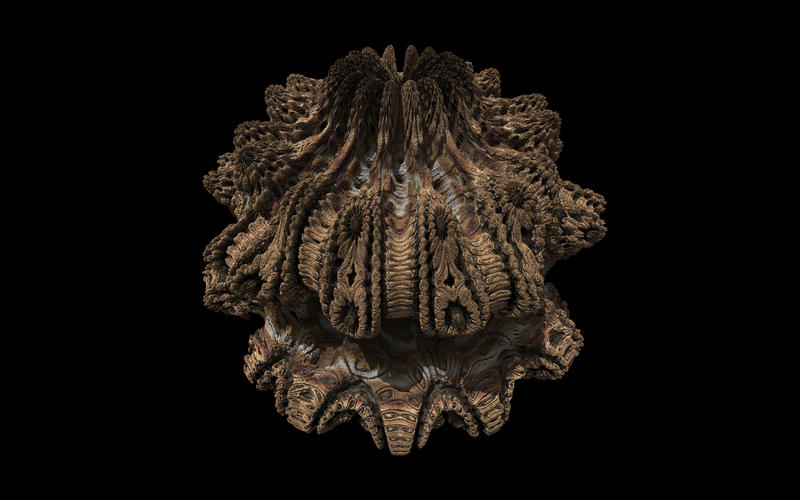 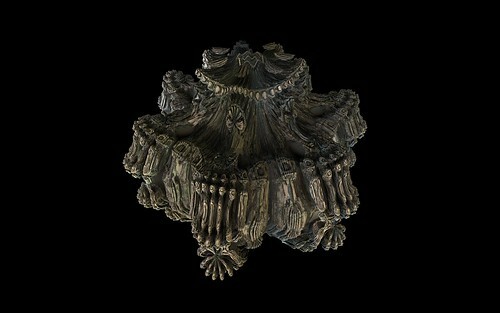 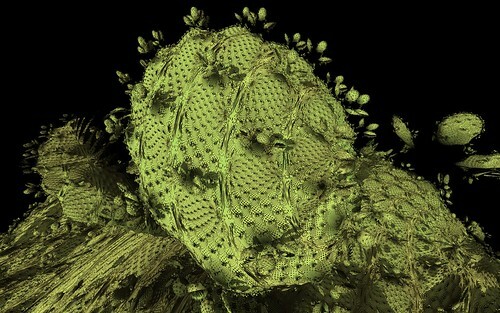 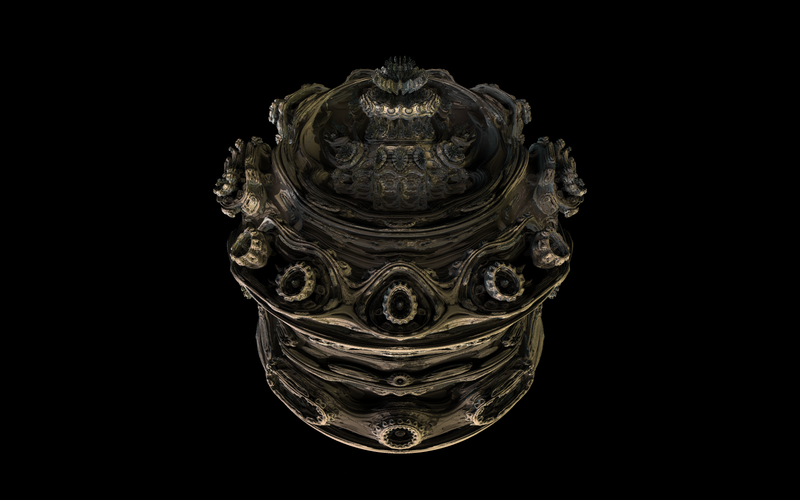 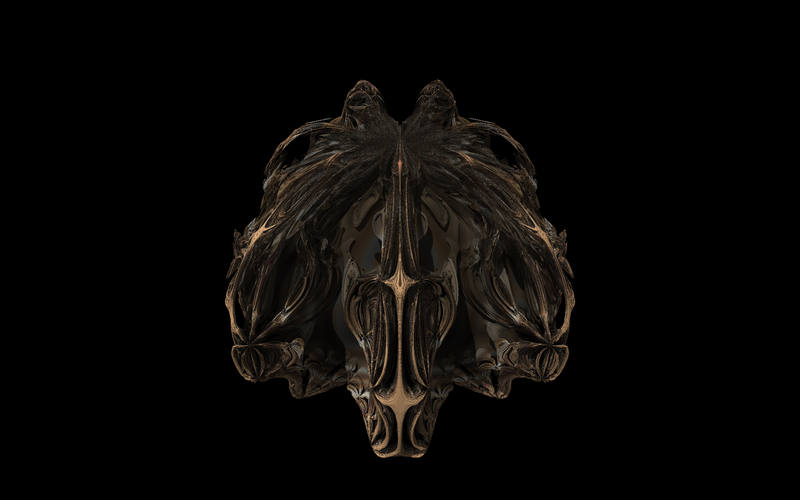 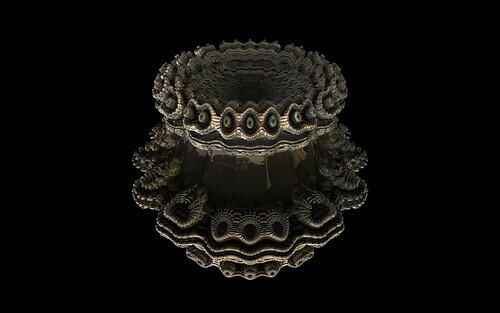 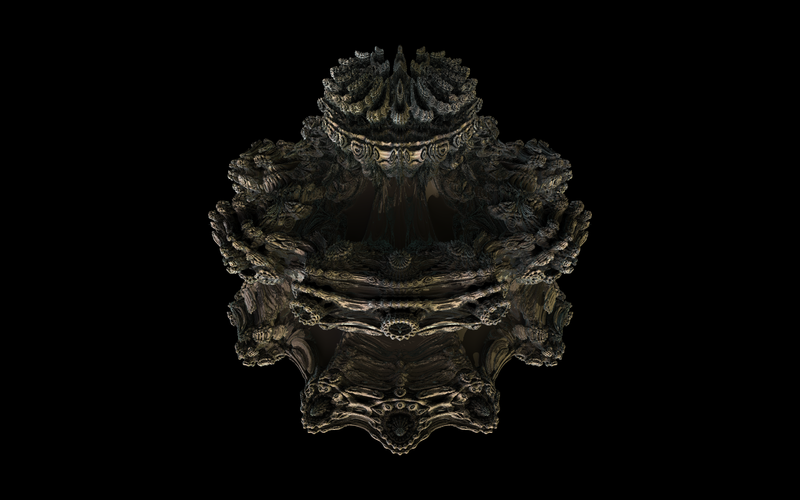 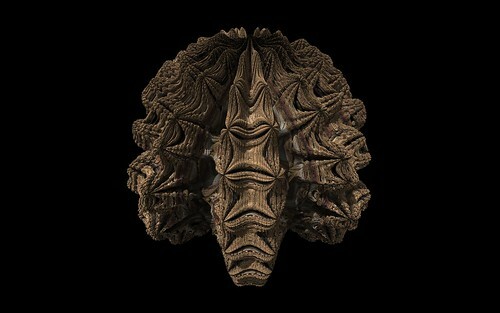 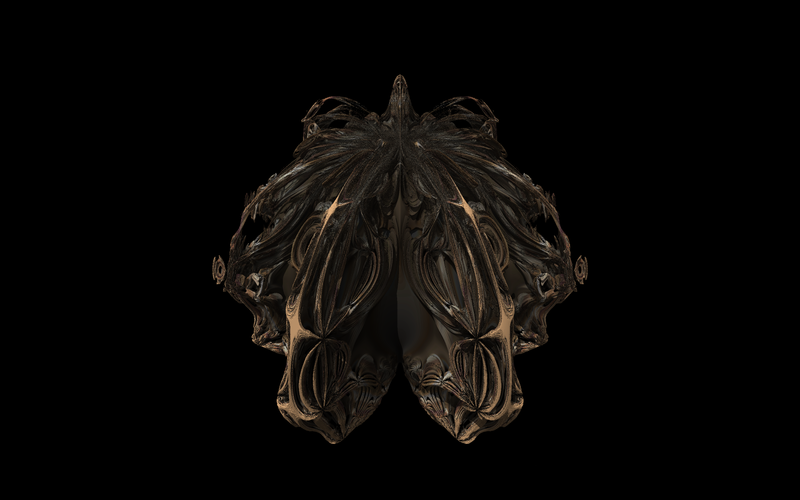 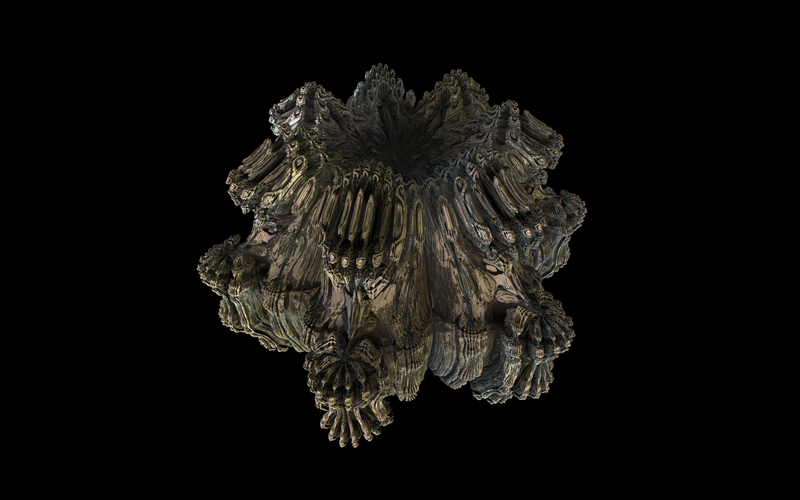 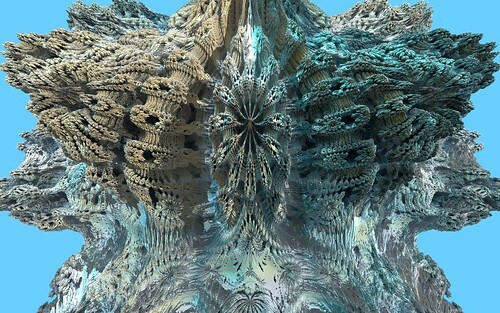 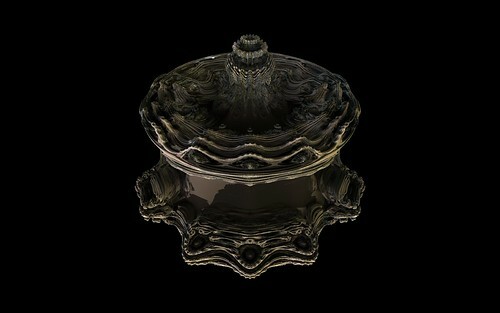 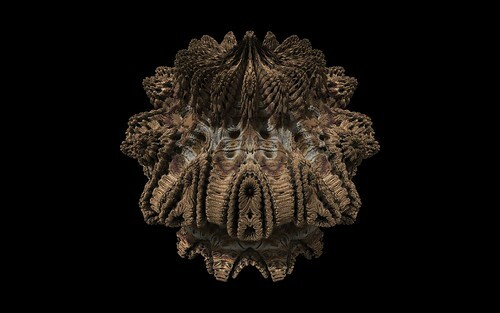 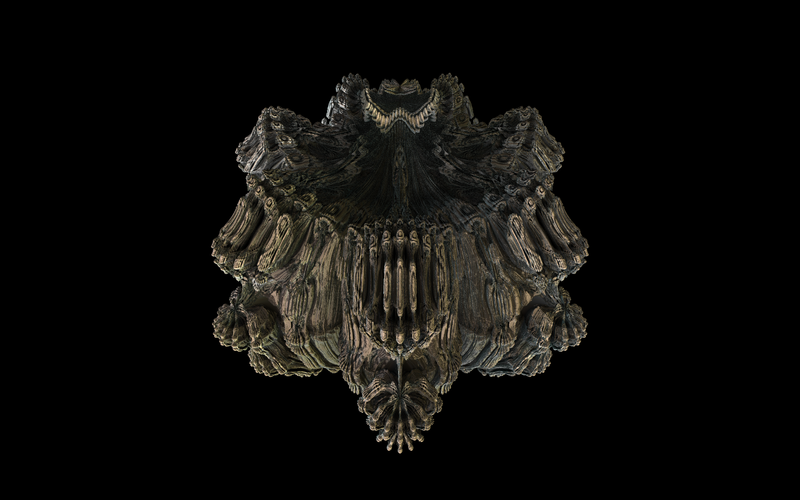 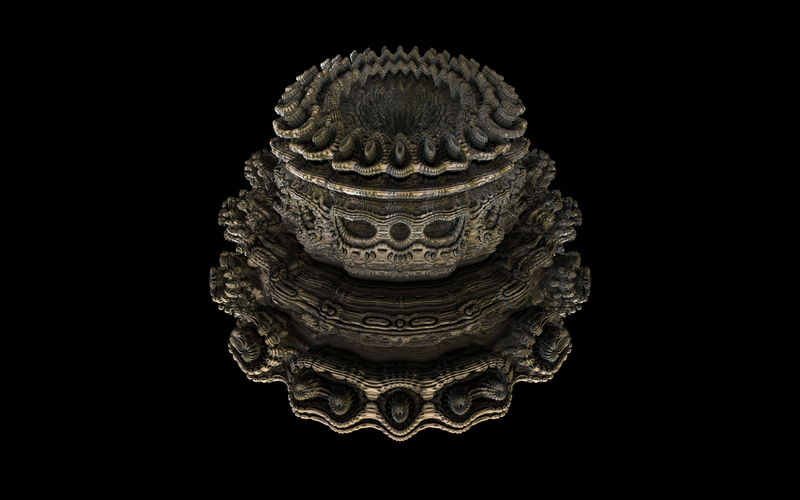 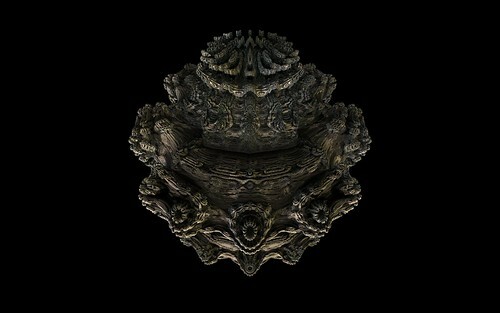 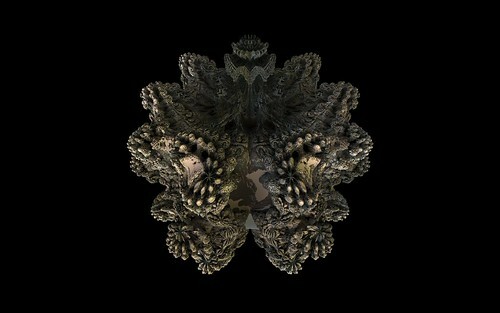 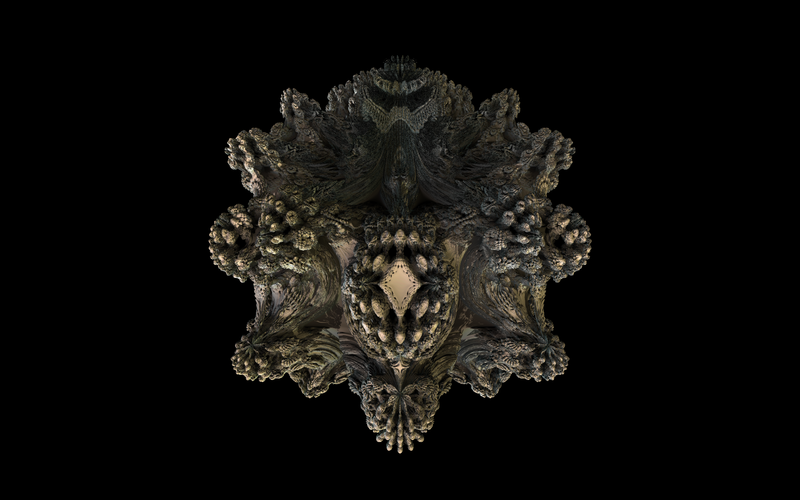 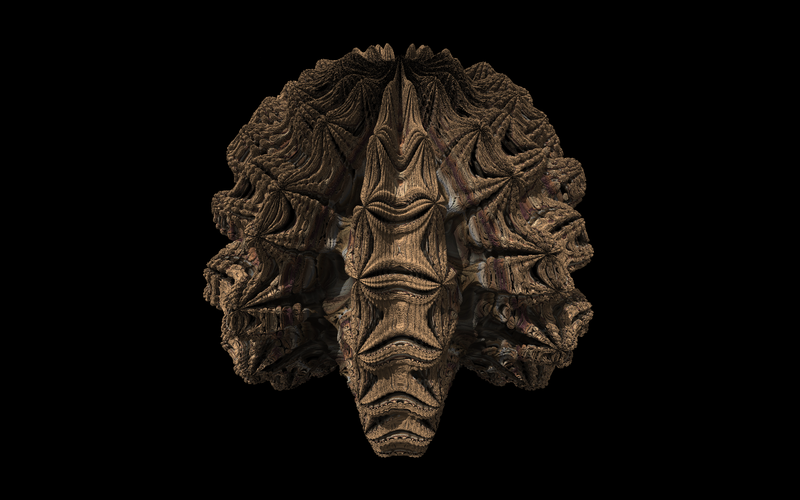 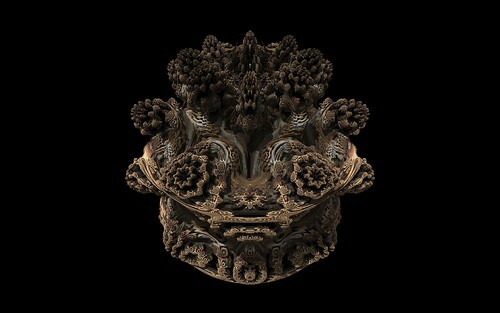 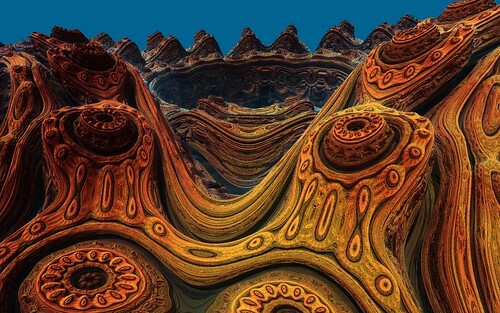 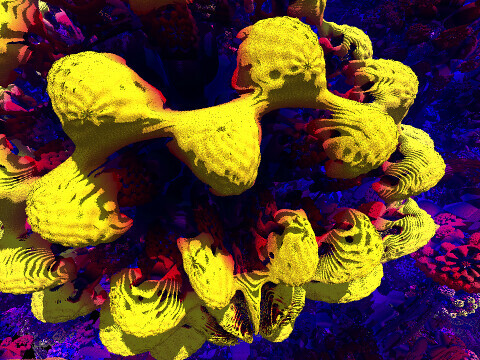 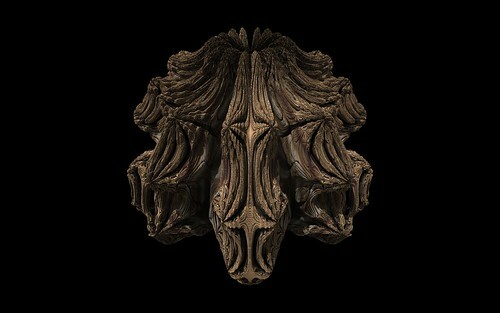 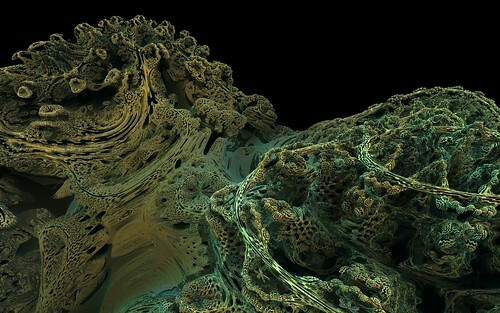 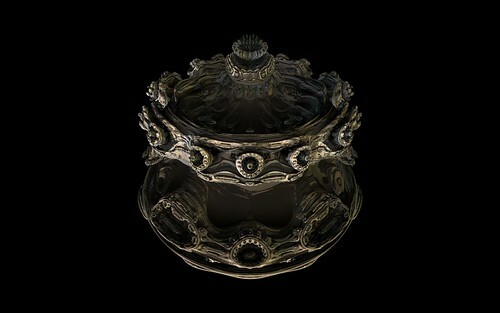 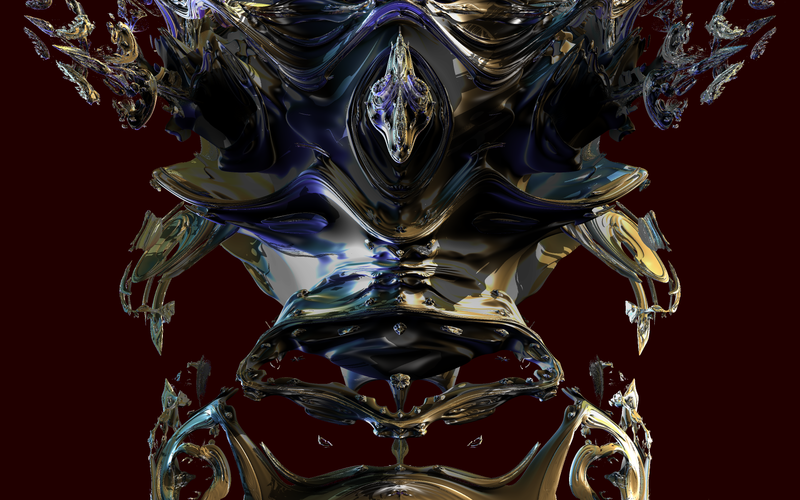 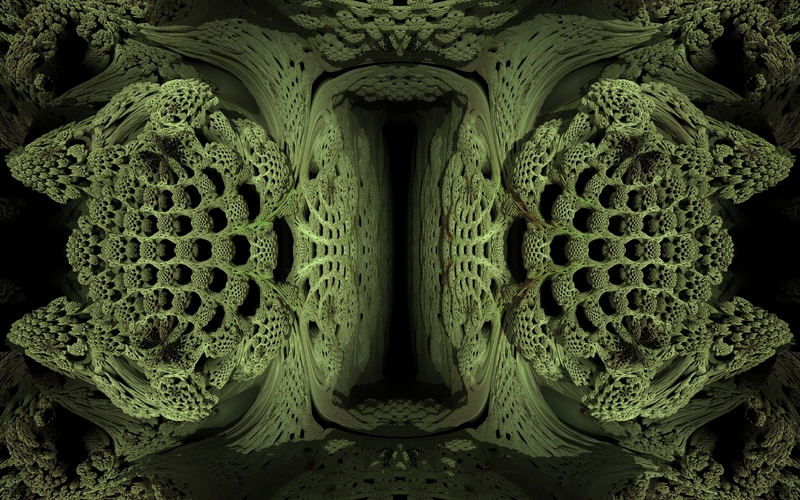 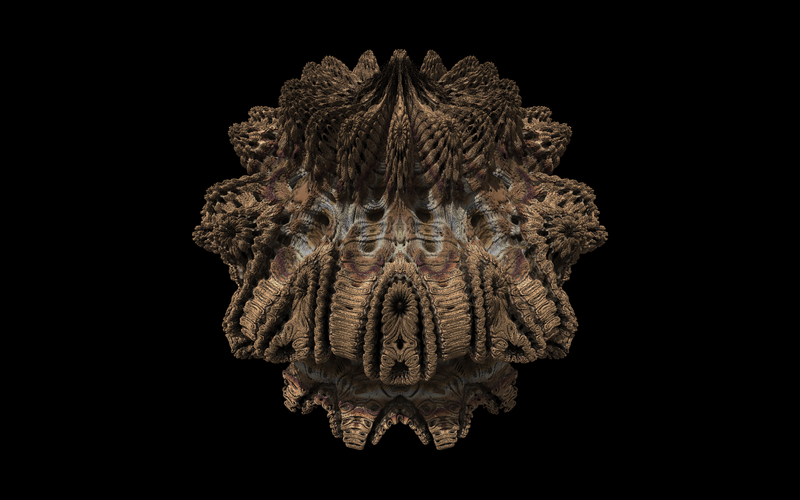 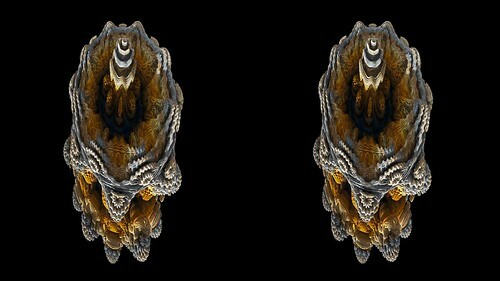 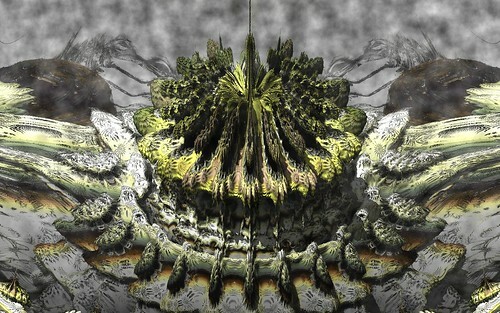 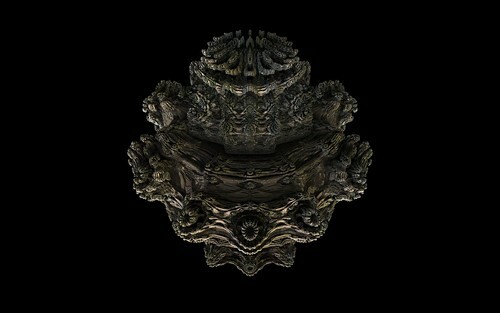 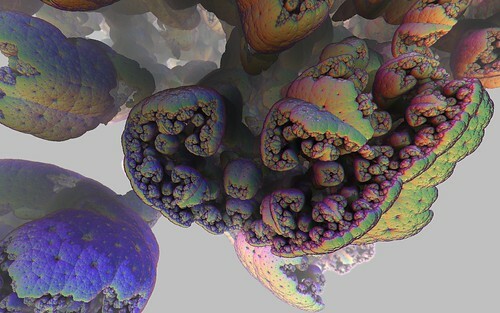 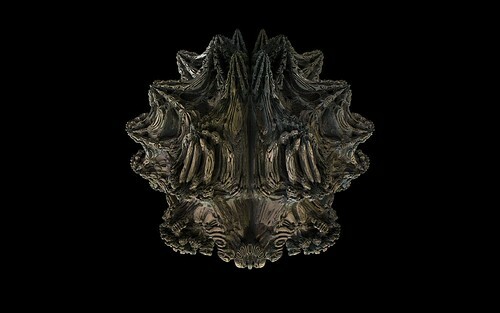 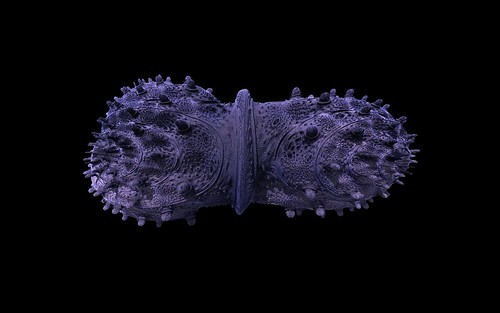 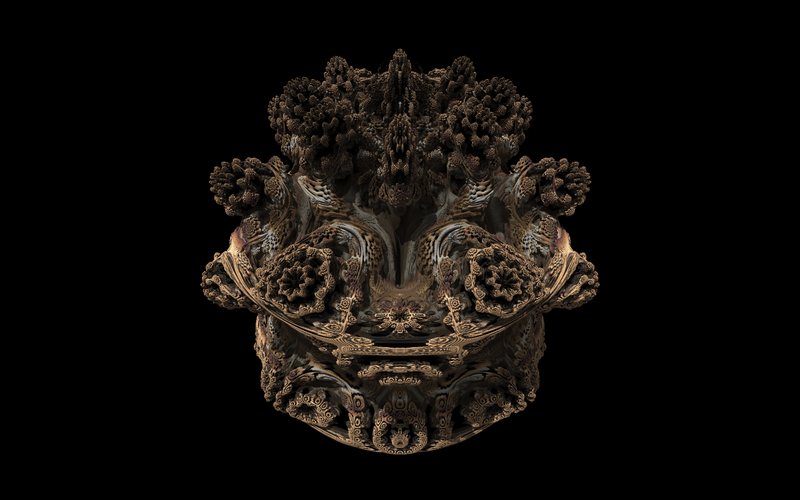 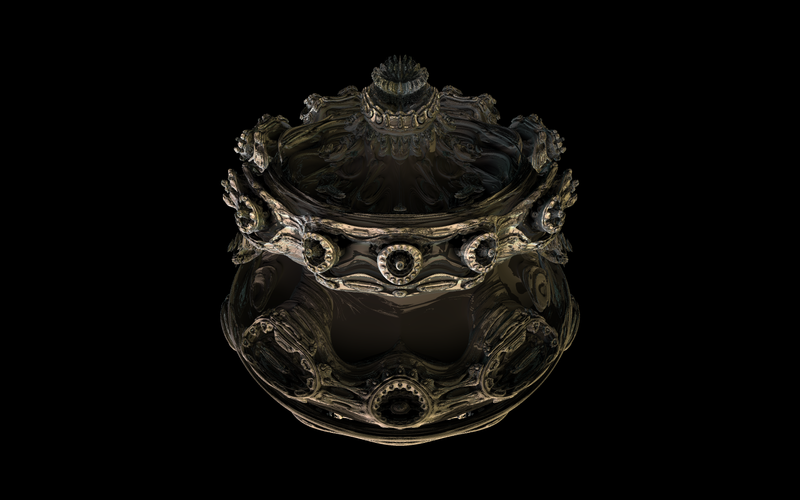 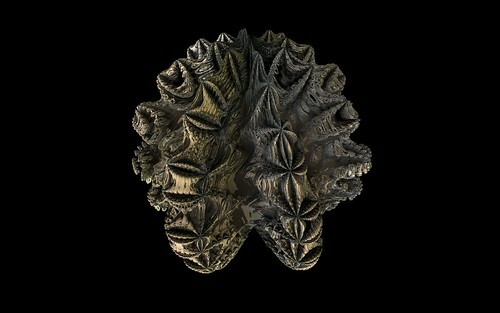 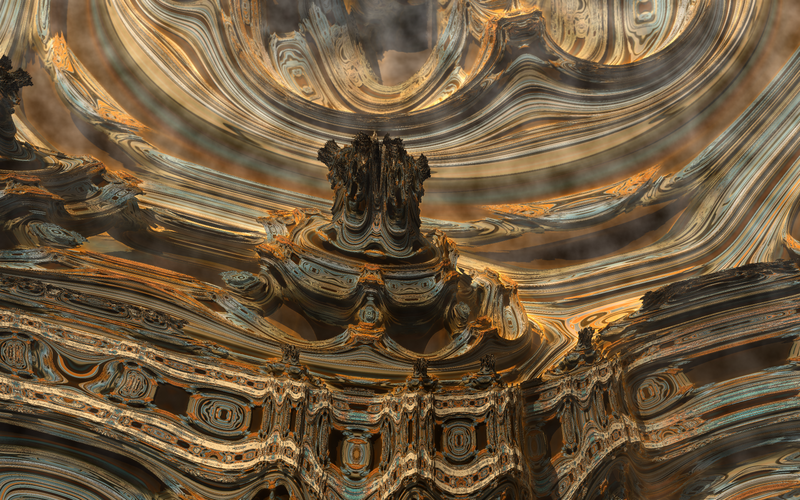 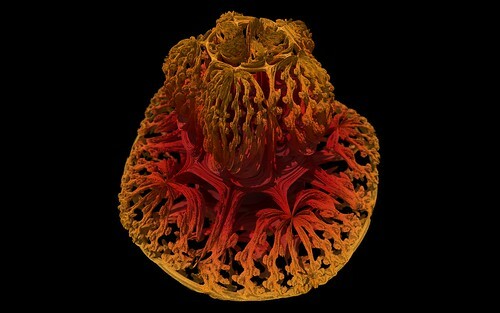 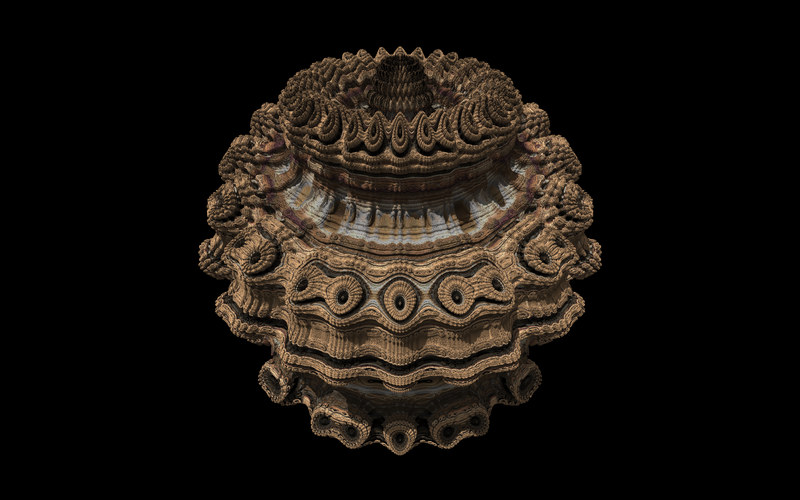 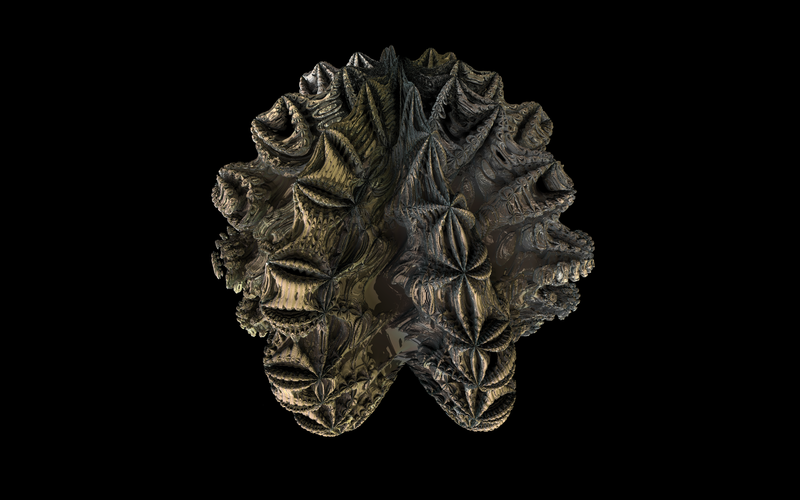 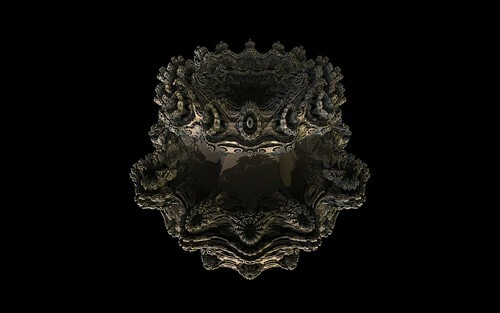 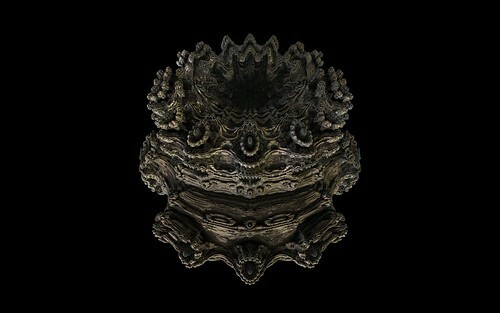 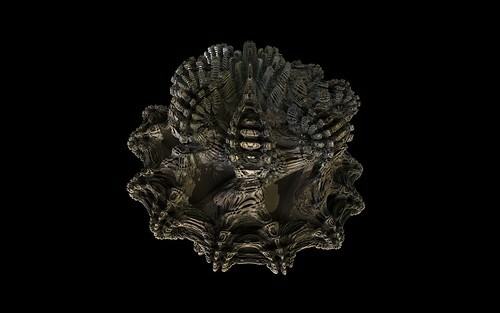 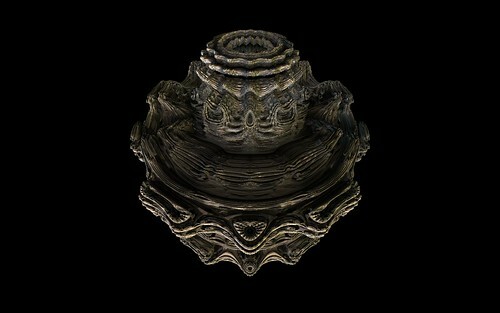 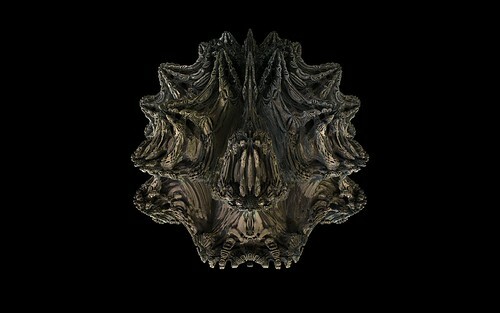 More sample images can be seen in my Hybrid Mandelbulb Gallery.